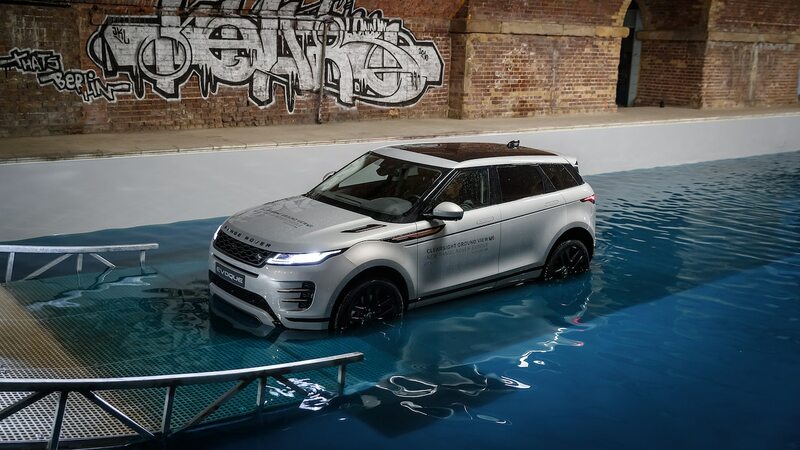 In science class we learned “entropy is always increasing.” We may not remember what this fundamental tenet of the second law of thermodynamics really means, but it comes to mind as we face a daily firehose of new products, services, clutter, information, news, and noise. 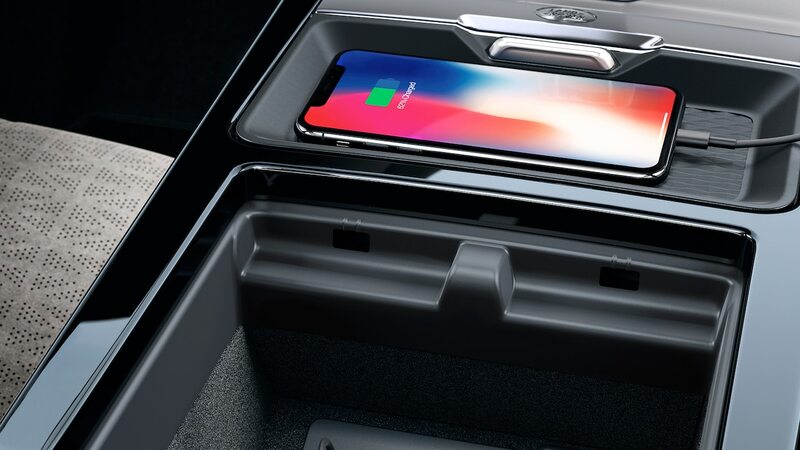 New products entering overcrowded markets clamor for attention with busy designs and brazen messaging. 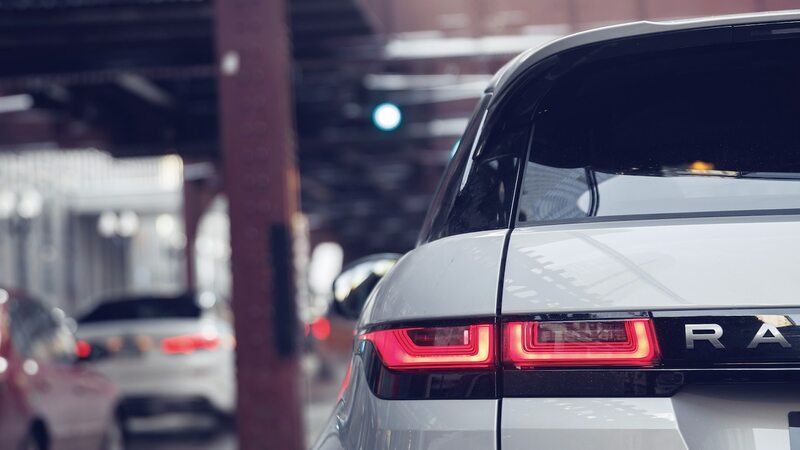 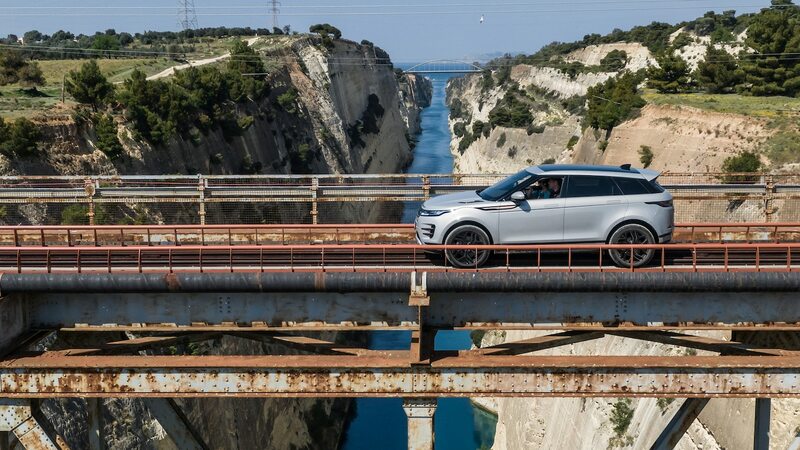 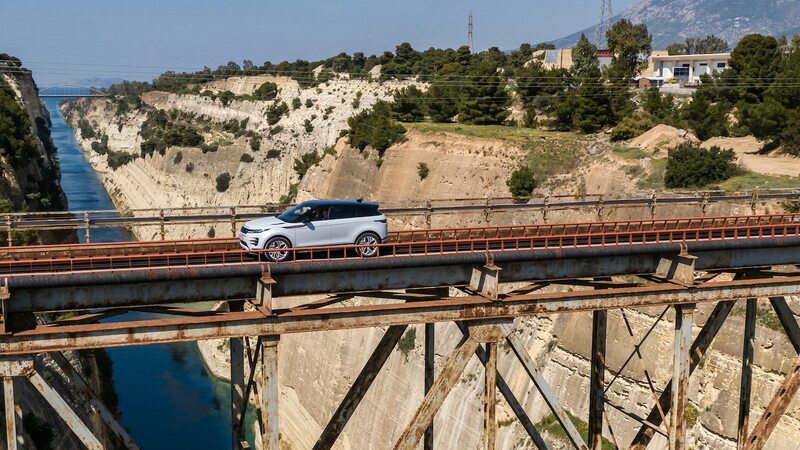 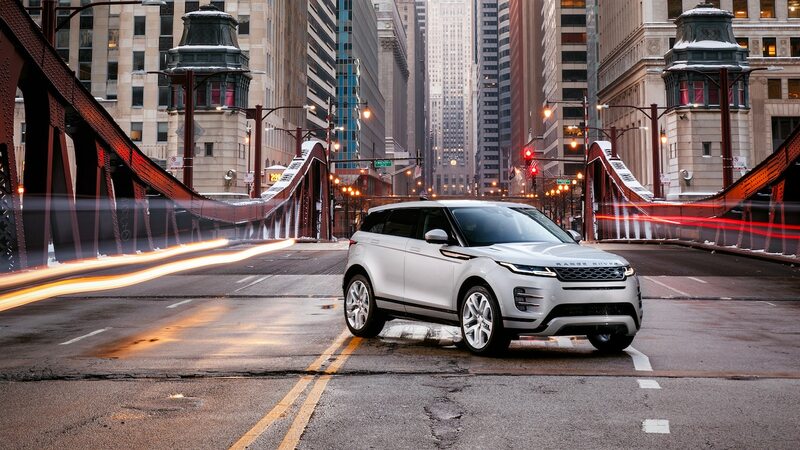 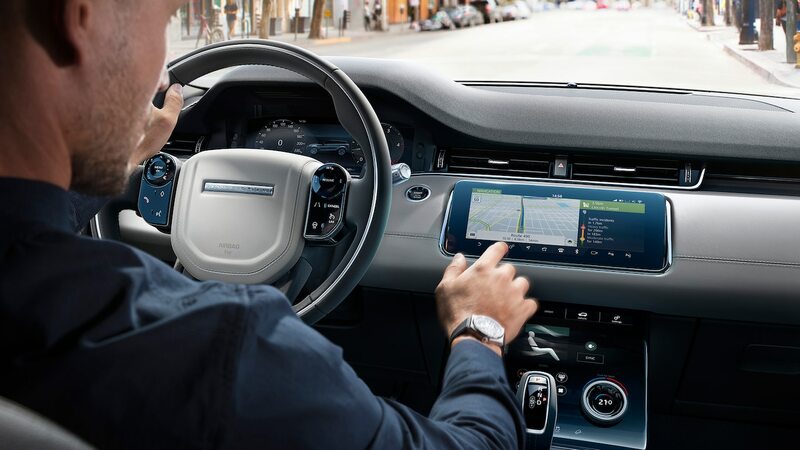 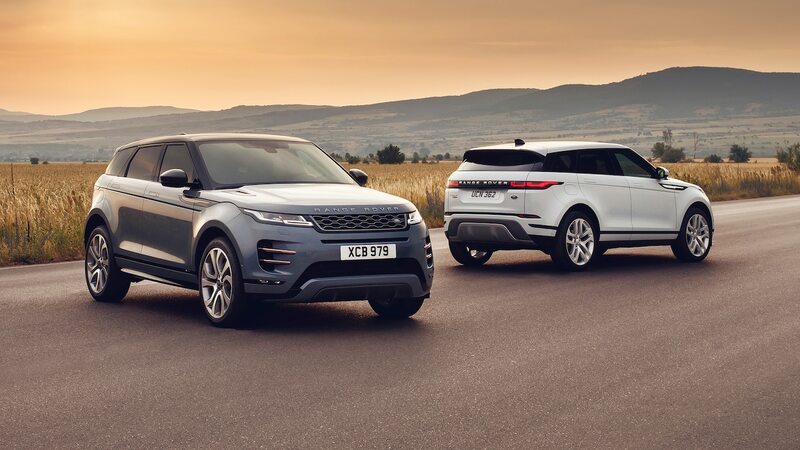 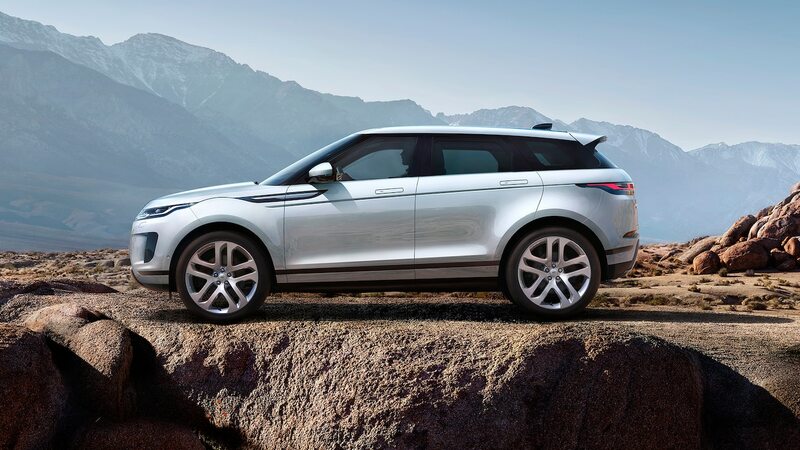 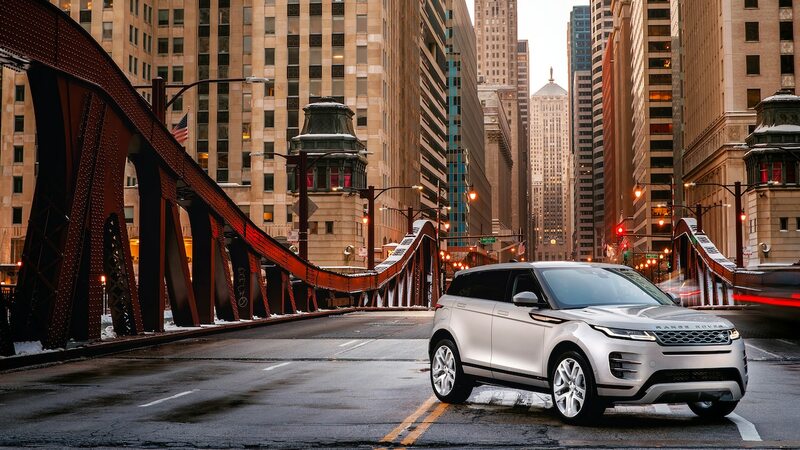 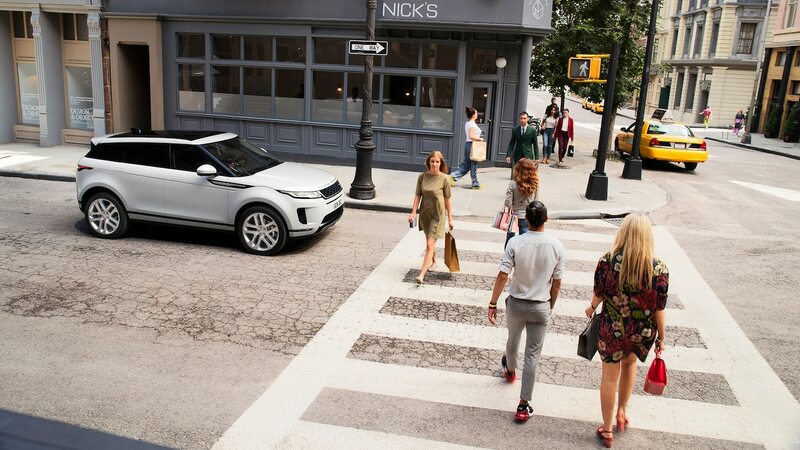 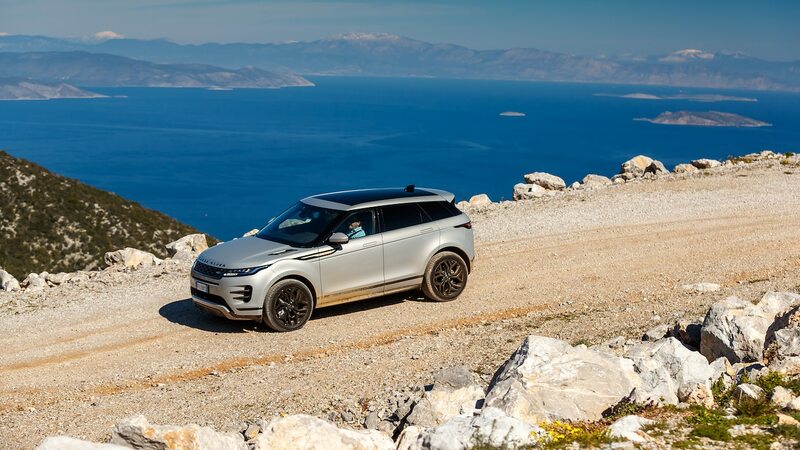 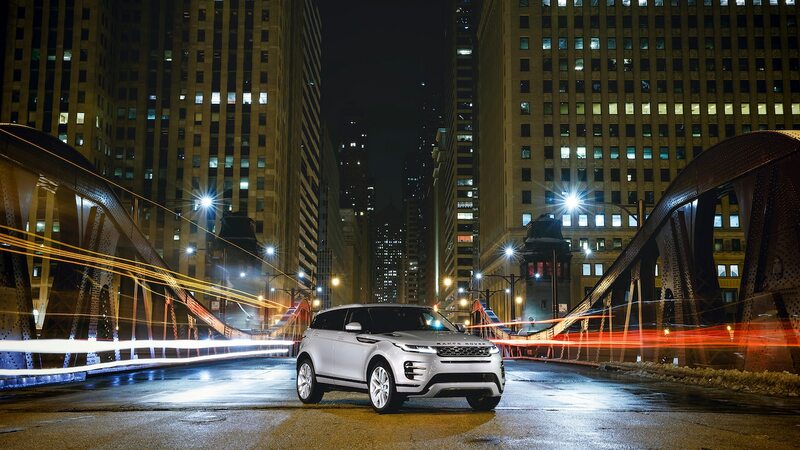 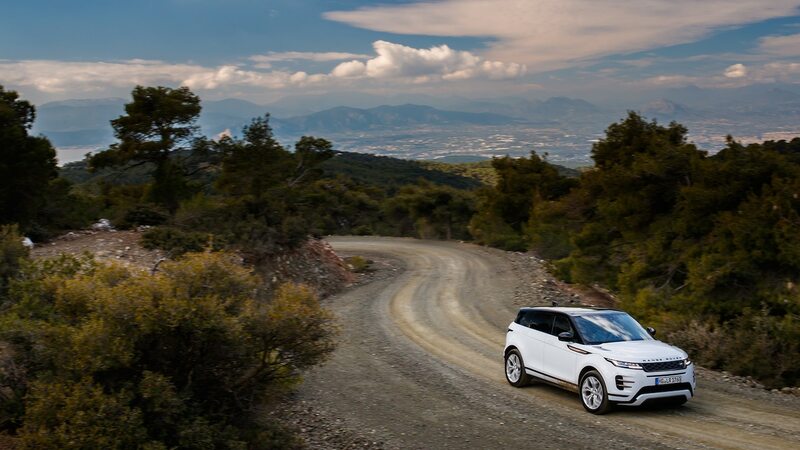 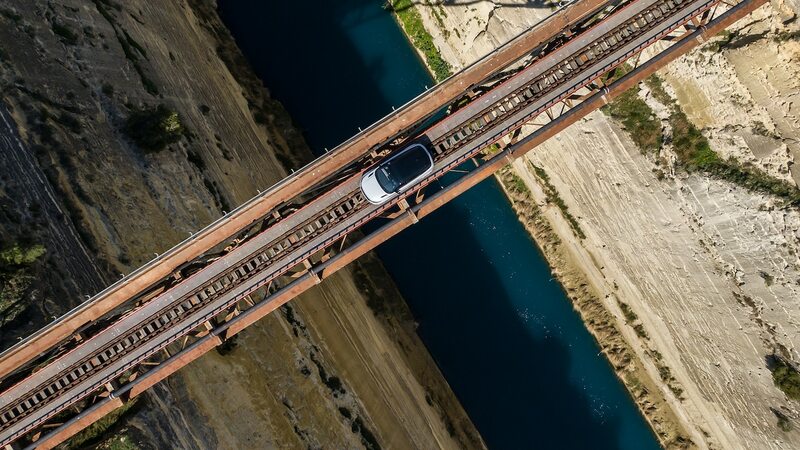 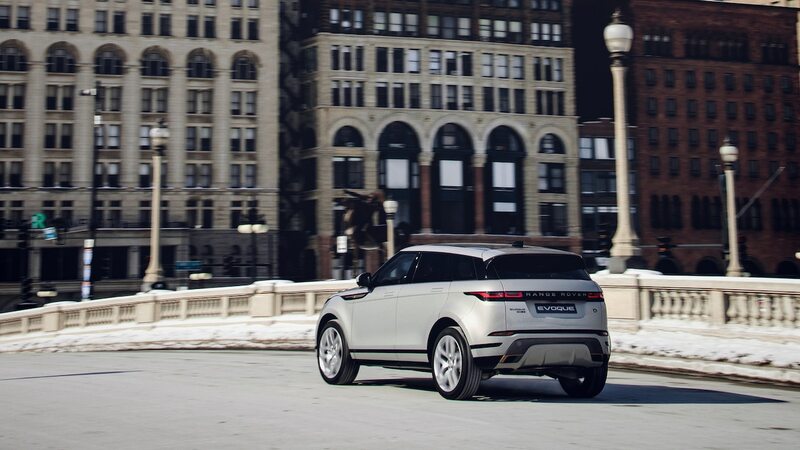 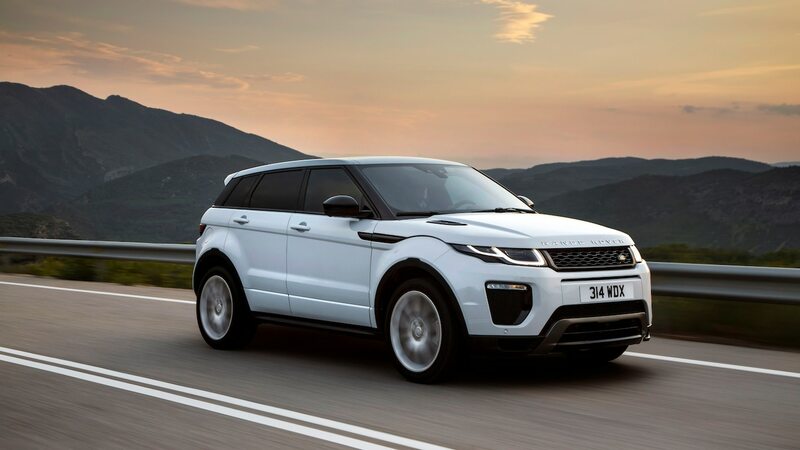 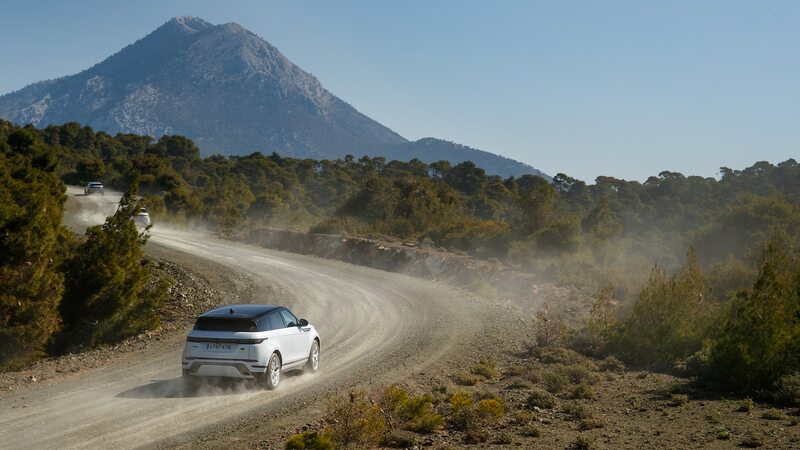 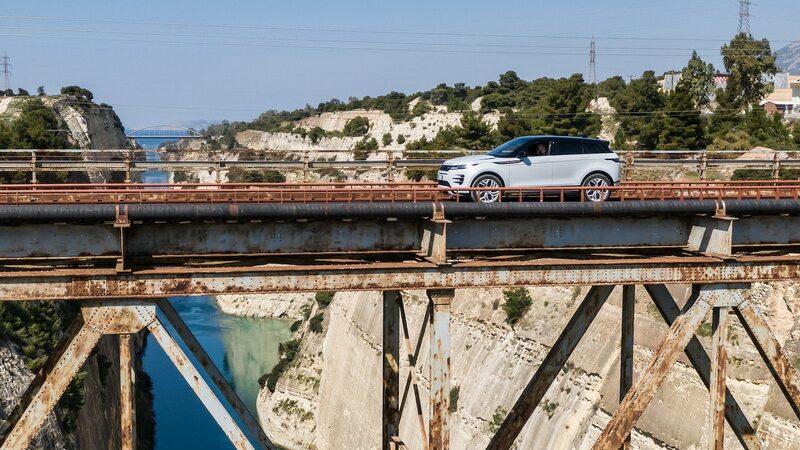 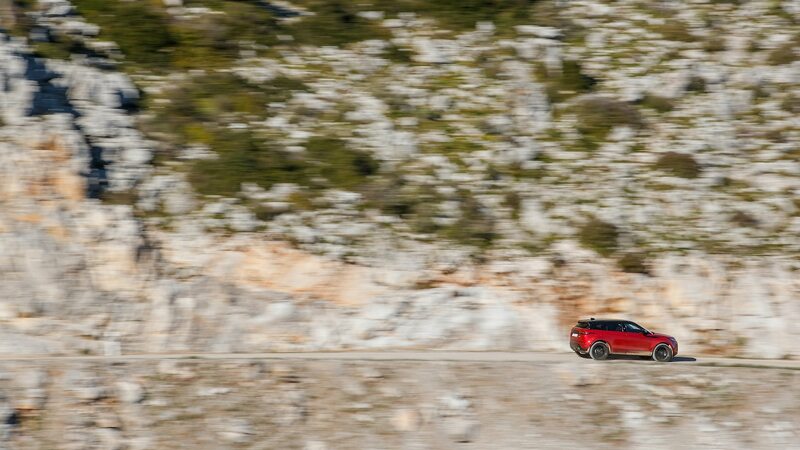 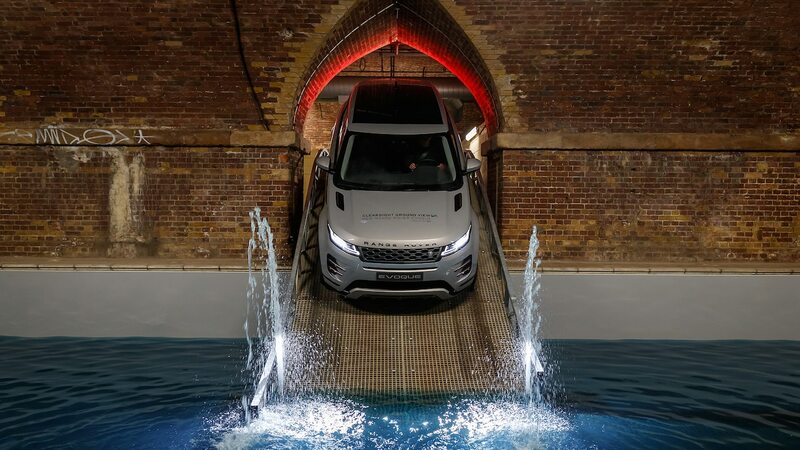 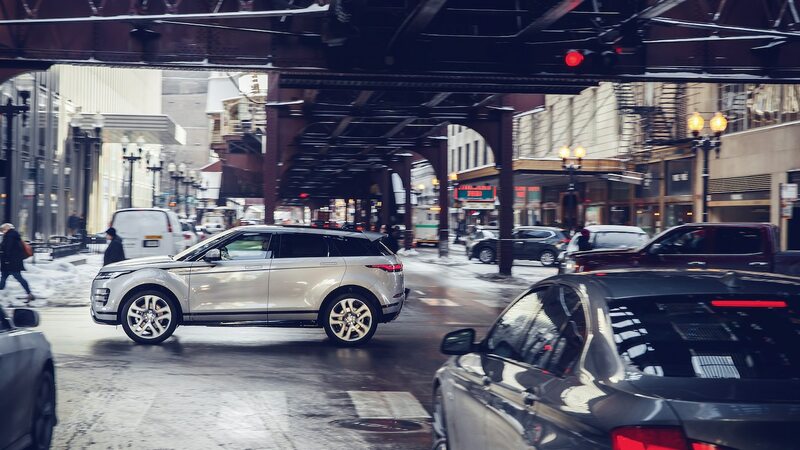 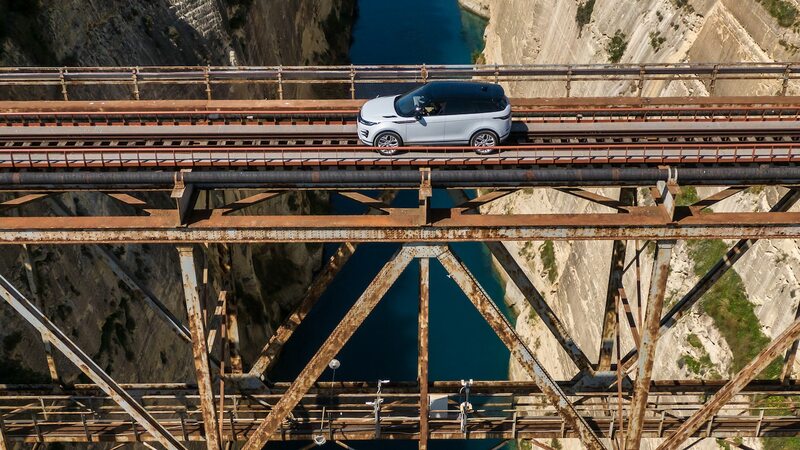 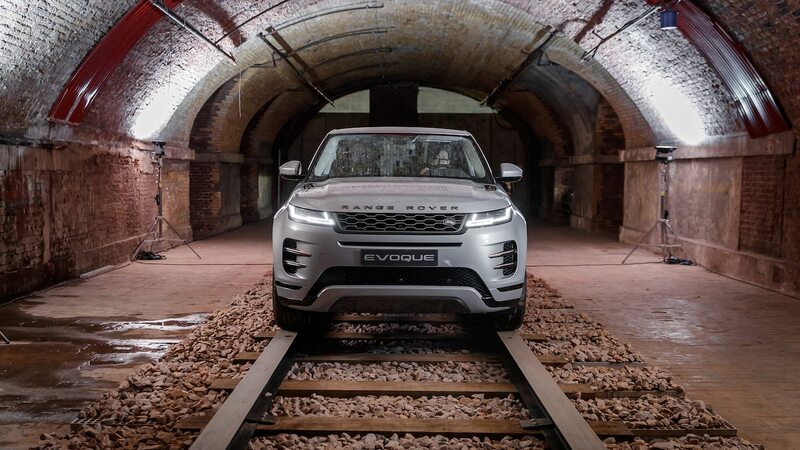 Against this cacophonous backdrop, Land Rover introduces a quieter, simplified, reductive redesign of the Range Rover Evoque that helped launch the small-luxury SUV market eight years ago and earned our 2012 SUV of the Year award. 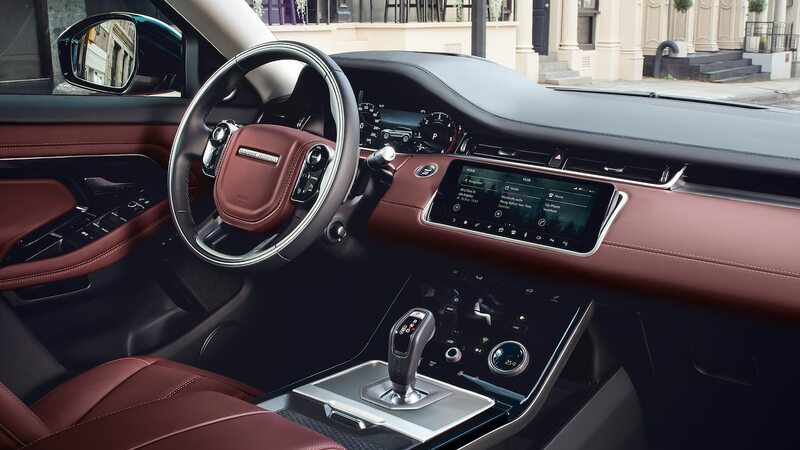 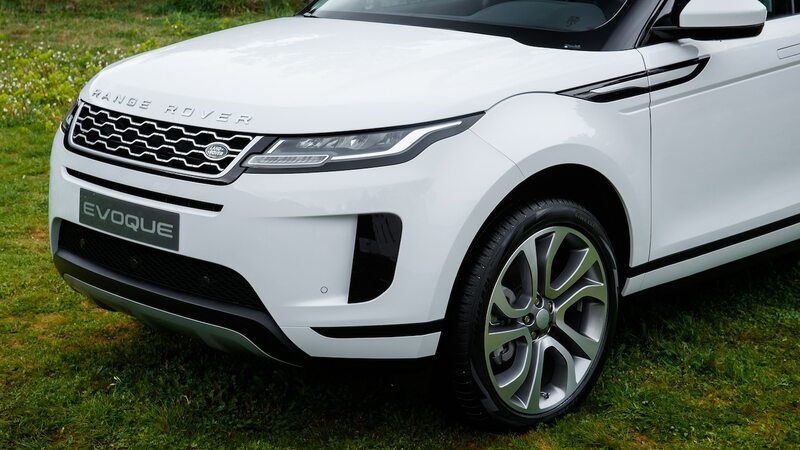 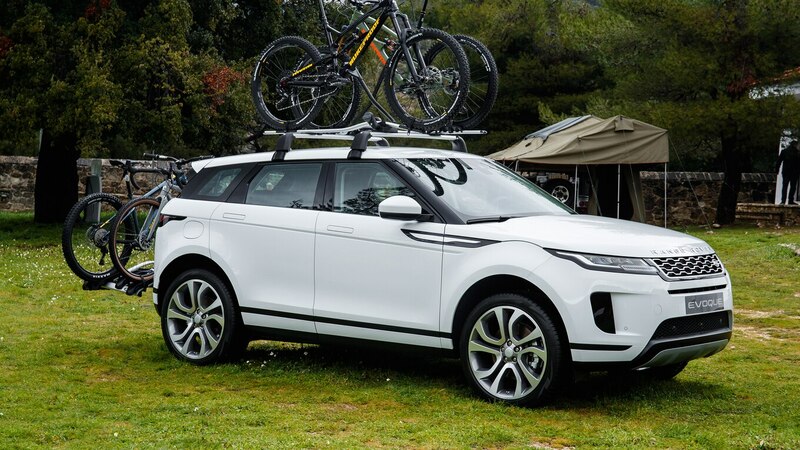 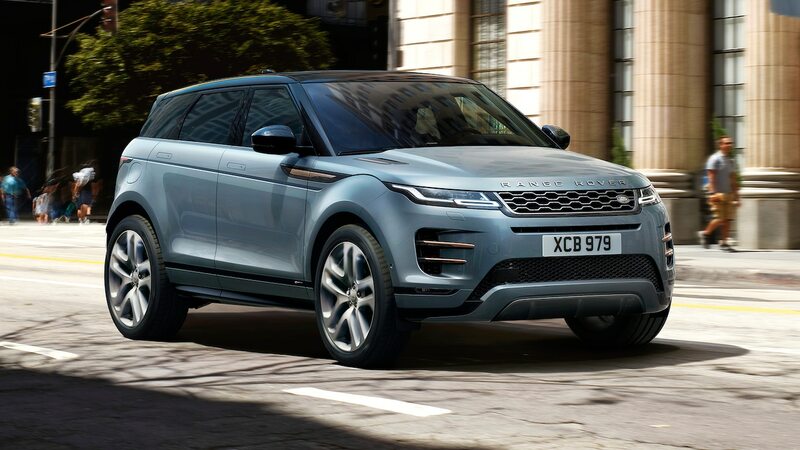 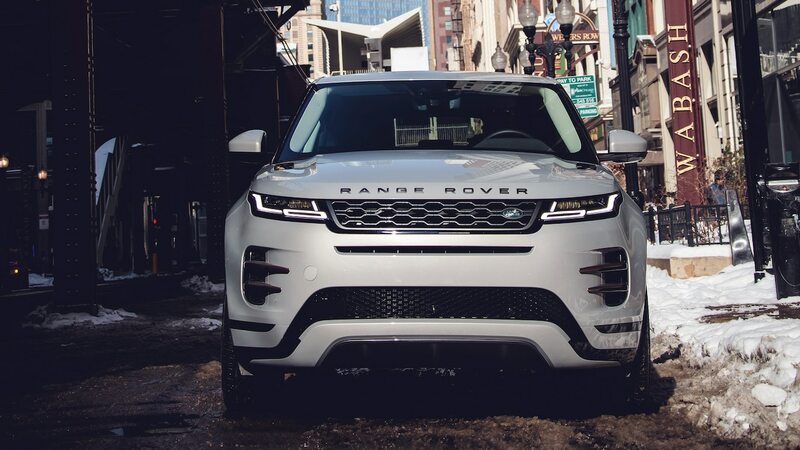 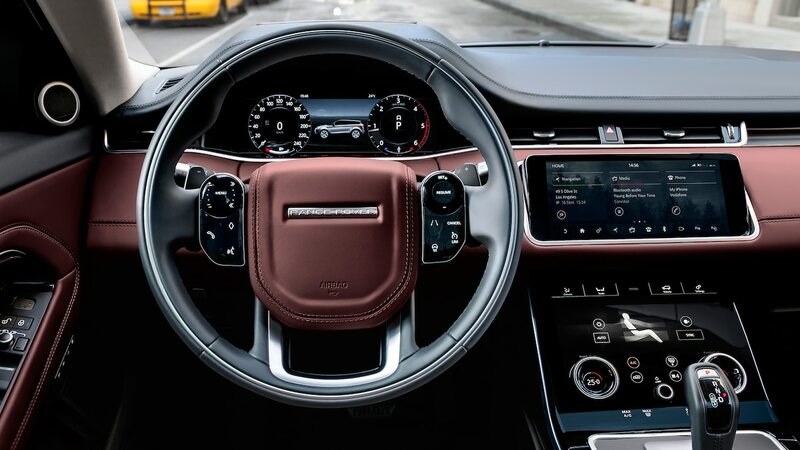 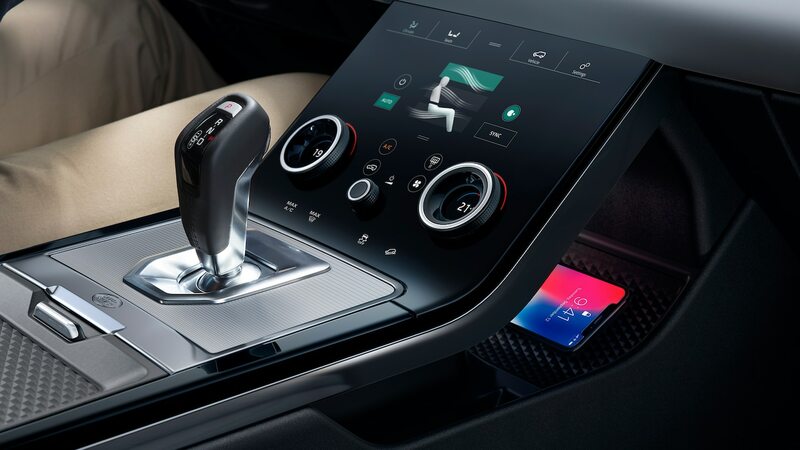 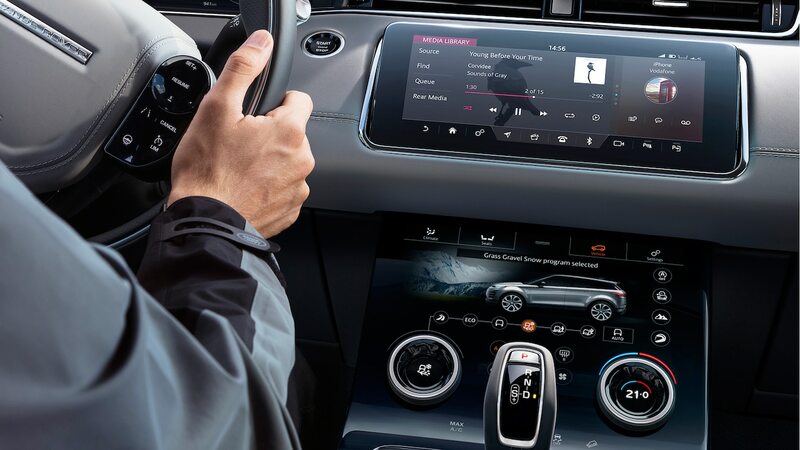 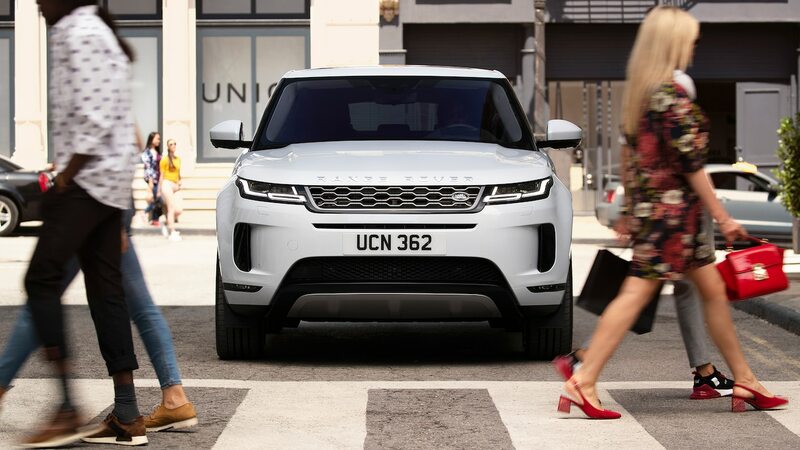 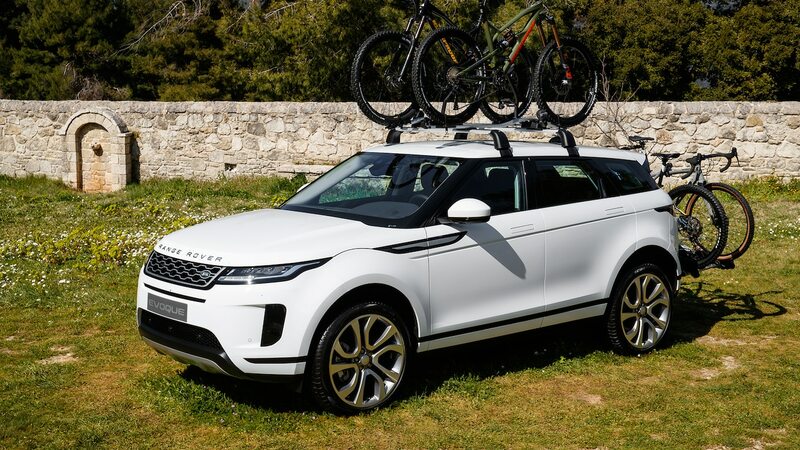 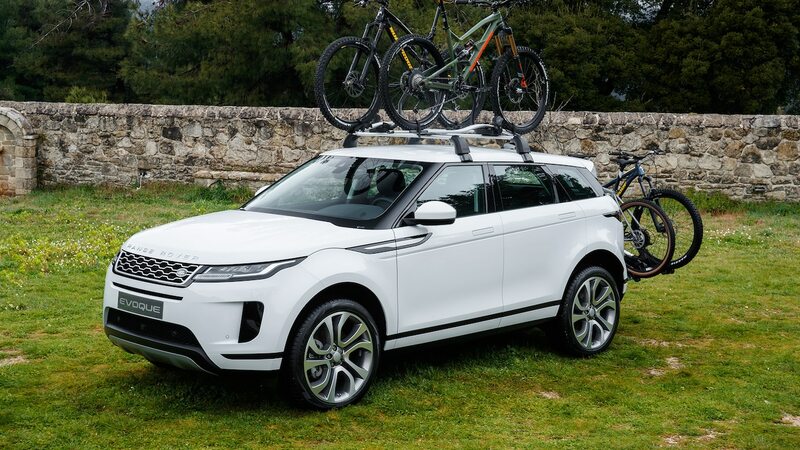 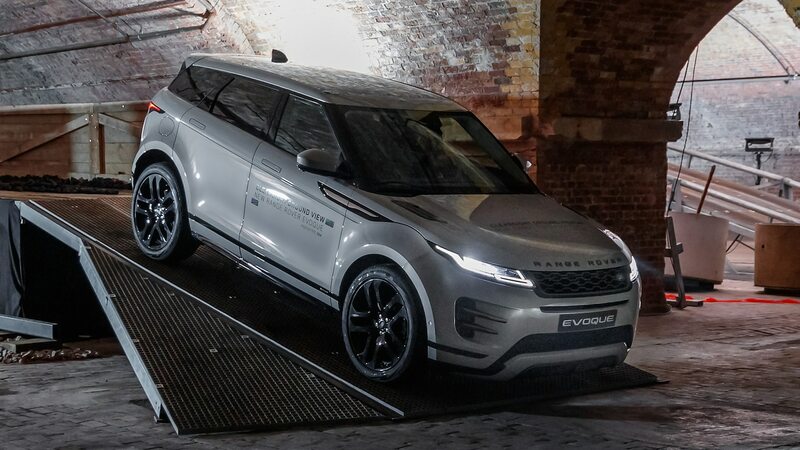 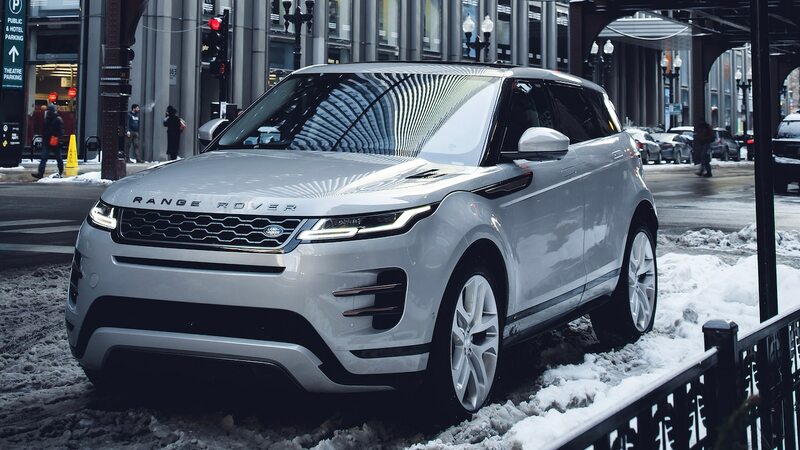 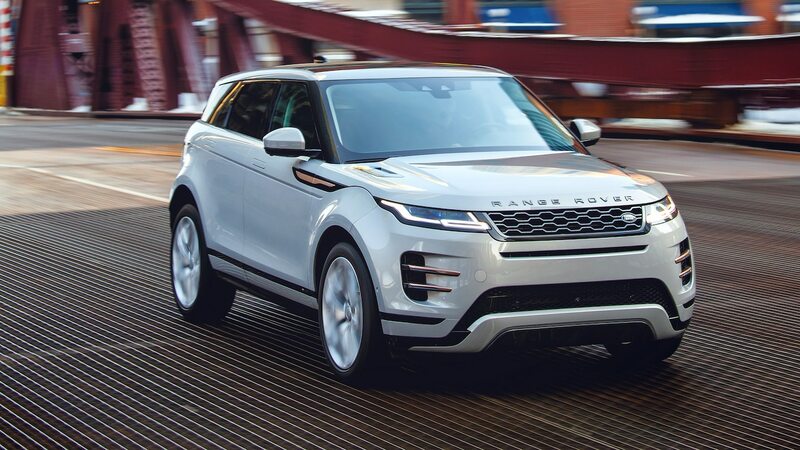 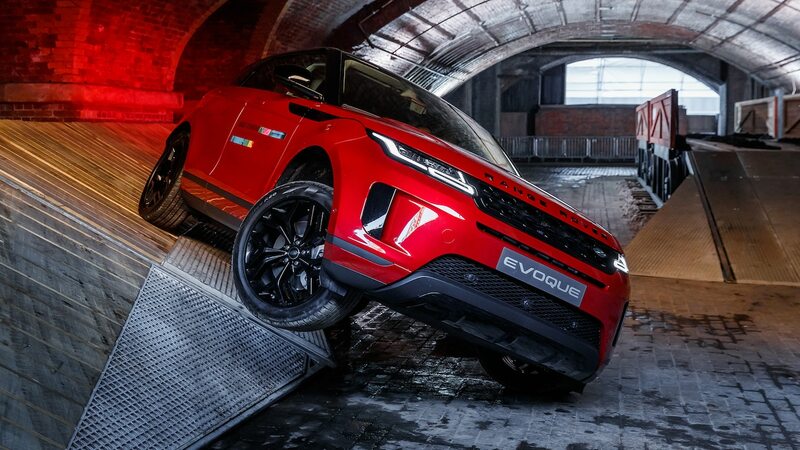 The Evoque has always been reductive by nature, aimed at youthful, style-conscious urbanites who value tidy parking dimensions over V-8 power or a go-everywhere, low-range drivetrain and height-adjustable suspension. 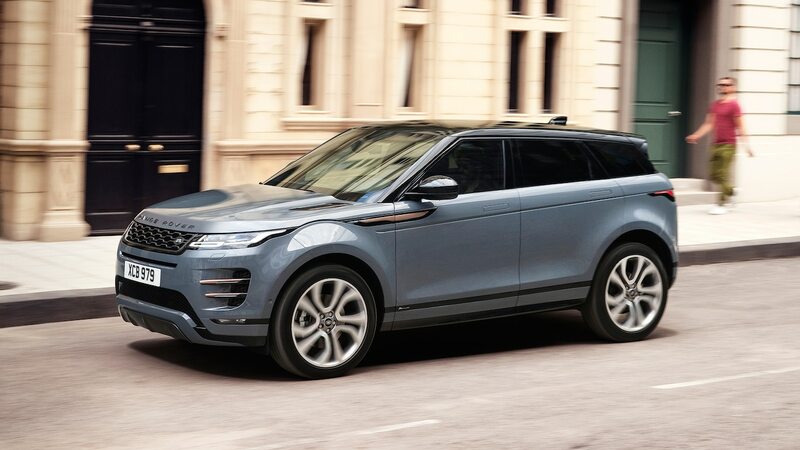 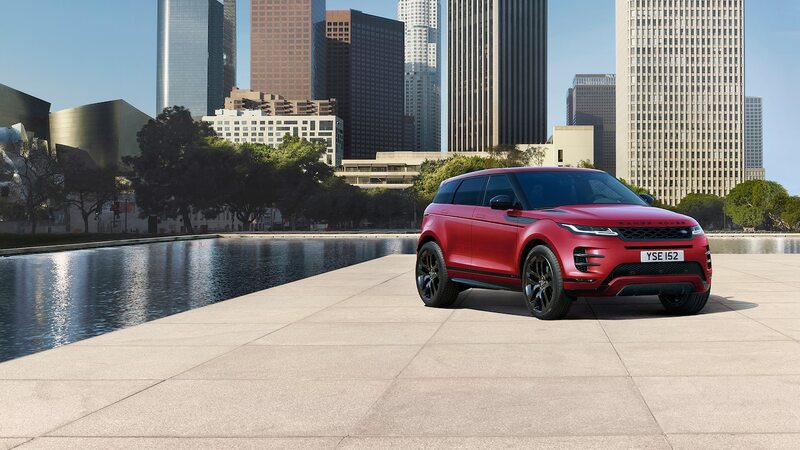 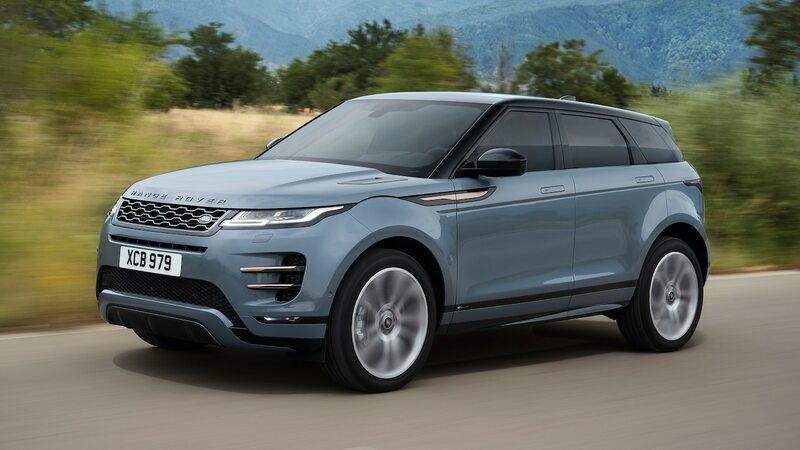 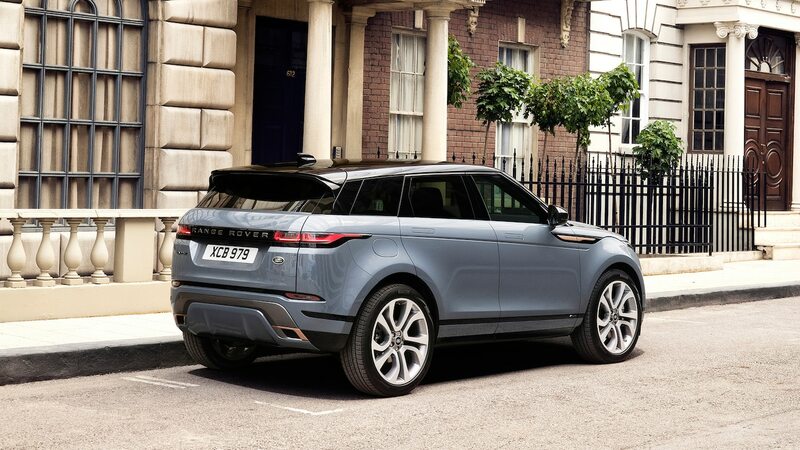 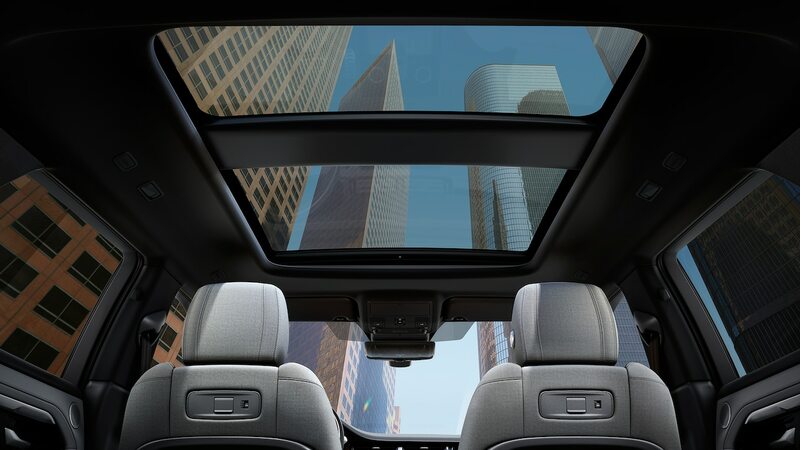 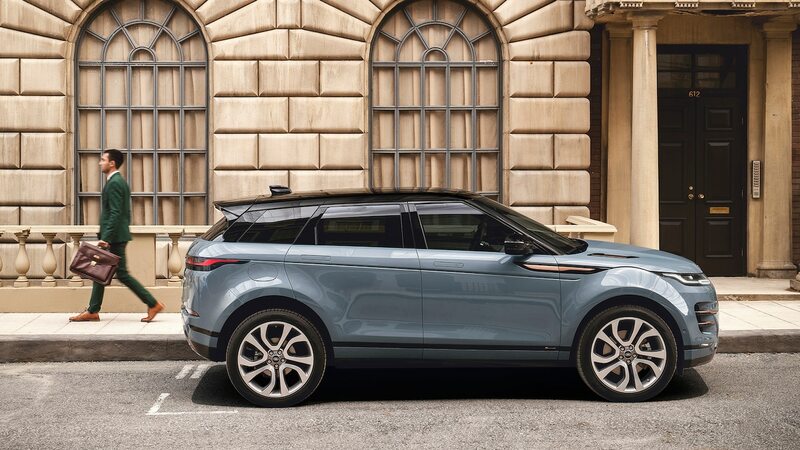 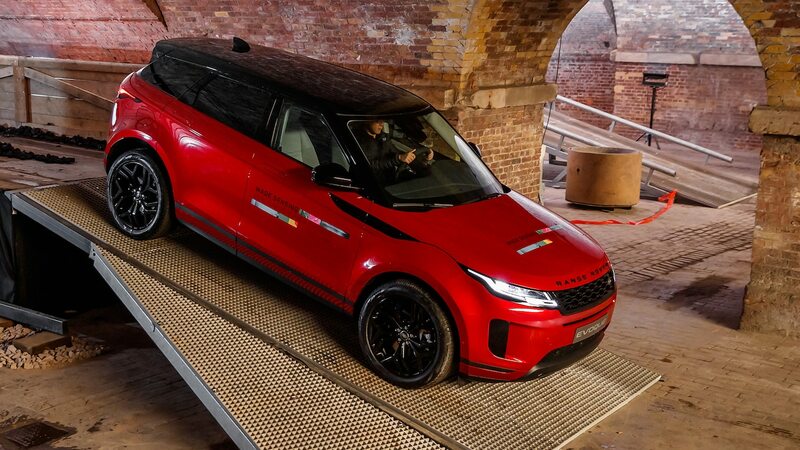 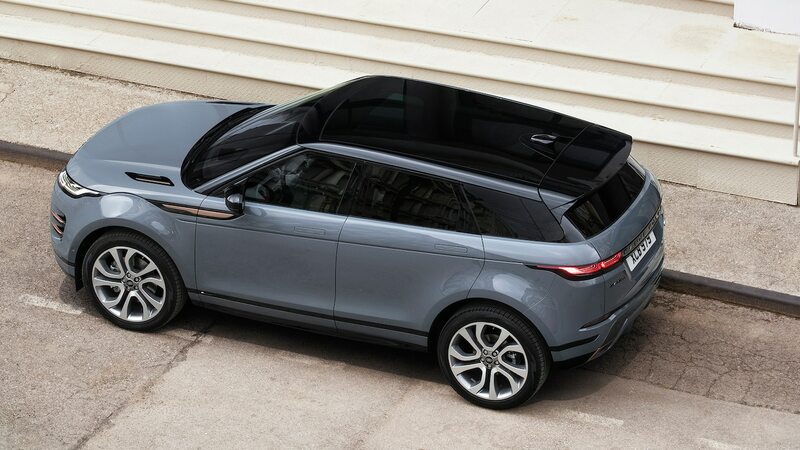 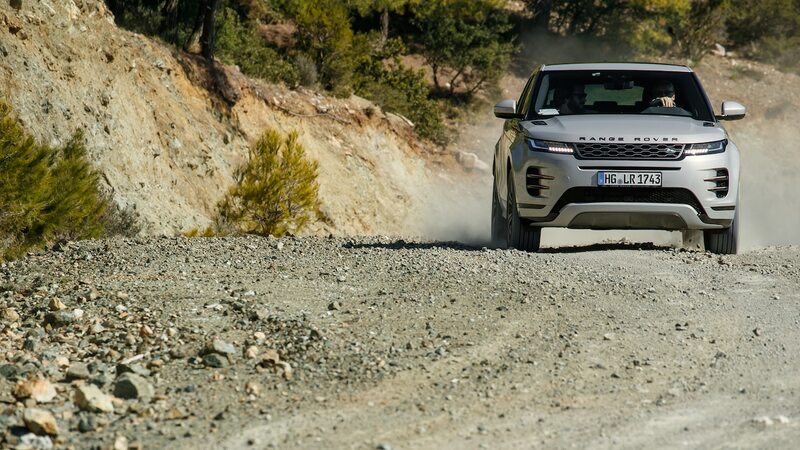 To boil this second-gen Evoque down even further, only the four-door body style will be offered, though it employs the sleeker, more rakish roofline of the former coupe (with its pano-roof made standard to claw back some of the lost headroom). 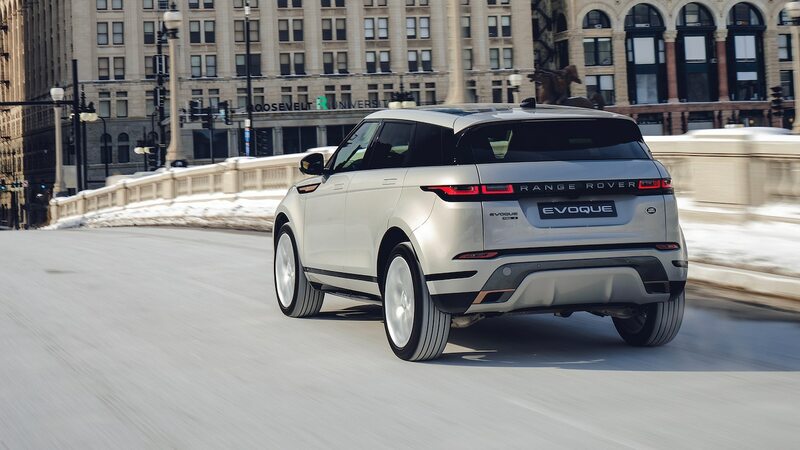 Trim level offerings drop from eight to six. 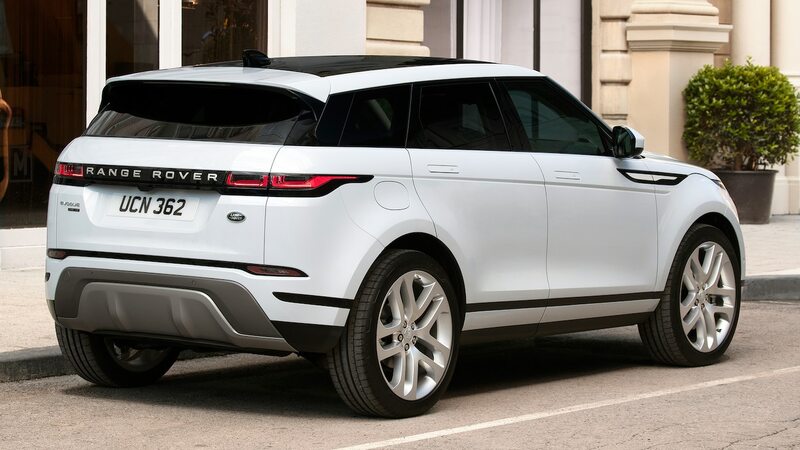 And Gerry McGovern’s already crisp, clean design gets cleansed of all nonessential character lines and trim pieces, losing the wheel arch and waist-rail moldings and making the door handles flush with the bodywork. 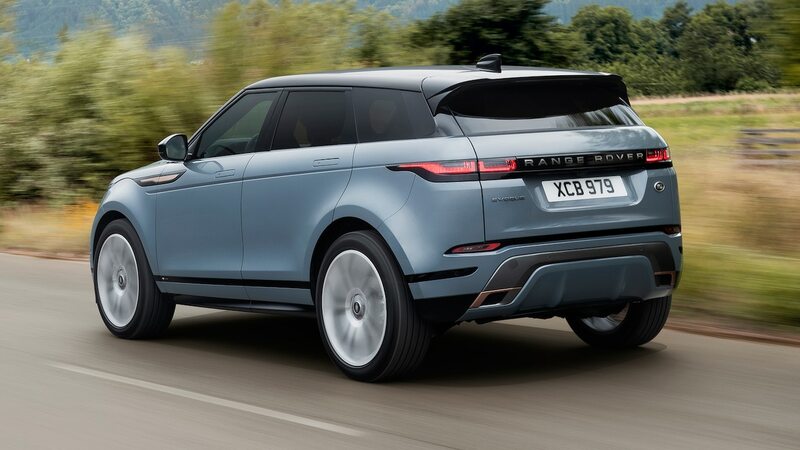 The proportions are improved by lengthening the wheelbase, reducing the overhangs, and making larger (21-inch) wheels available. 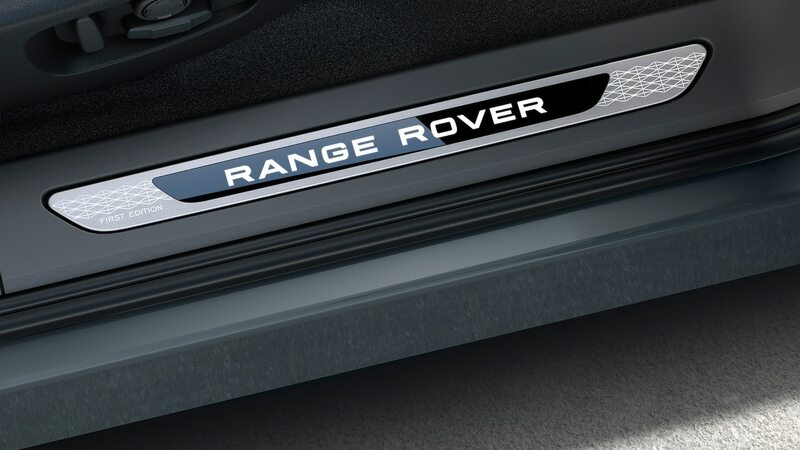 Improved crash-energy management (higher-strength steels) enables the front overhang reduction. 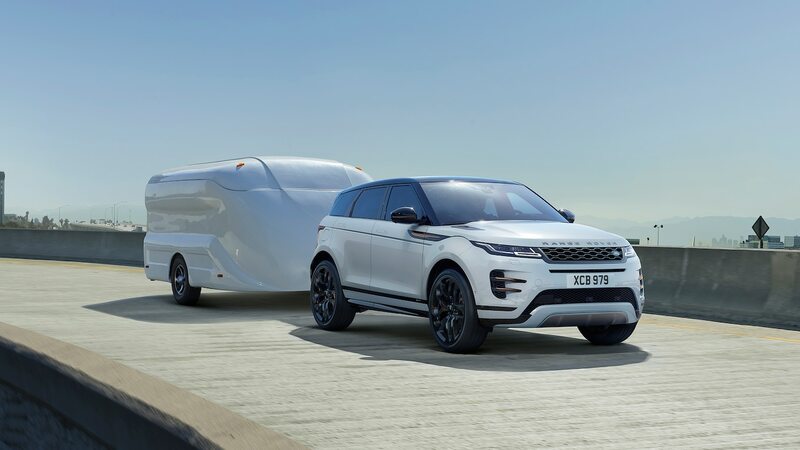 A clever new integral-link rear suspension consumes half as much vertical space as the previous multilink design, which boosts cargo volume by 6 percent. 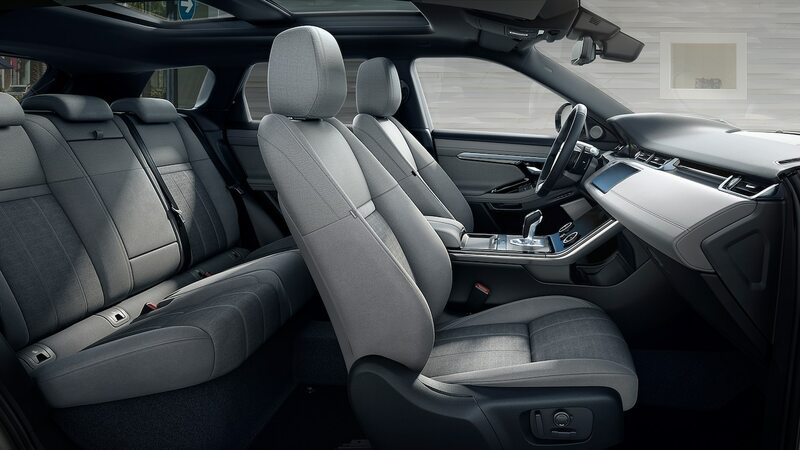 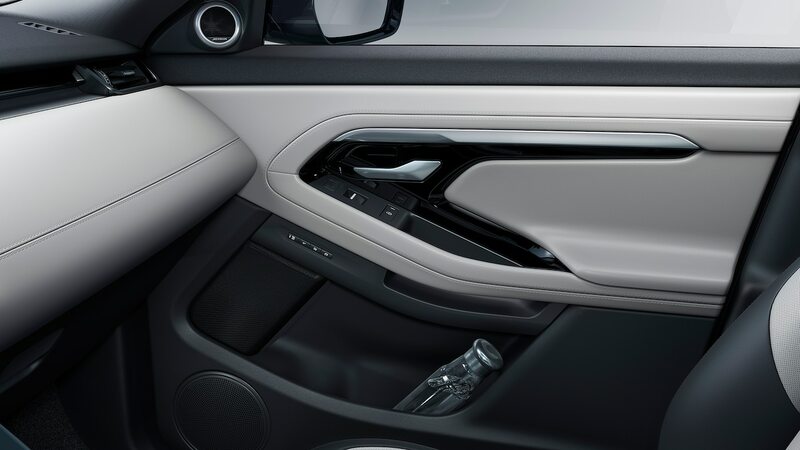 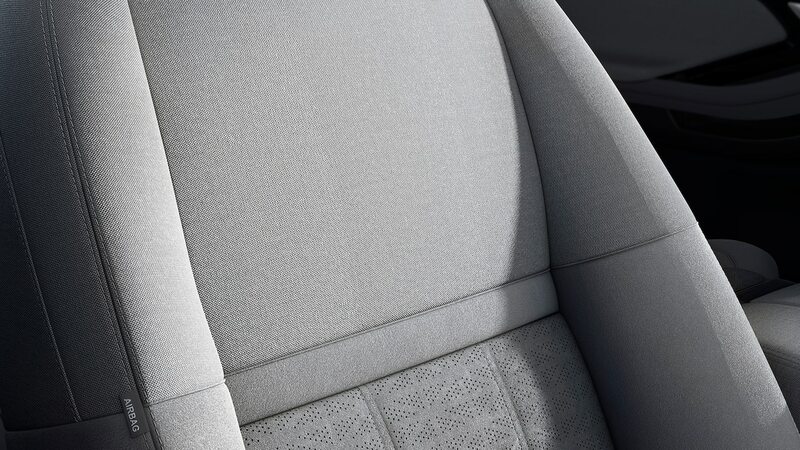 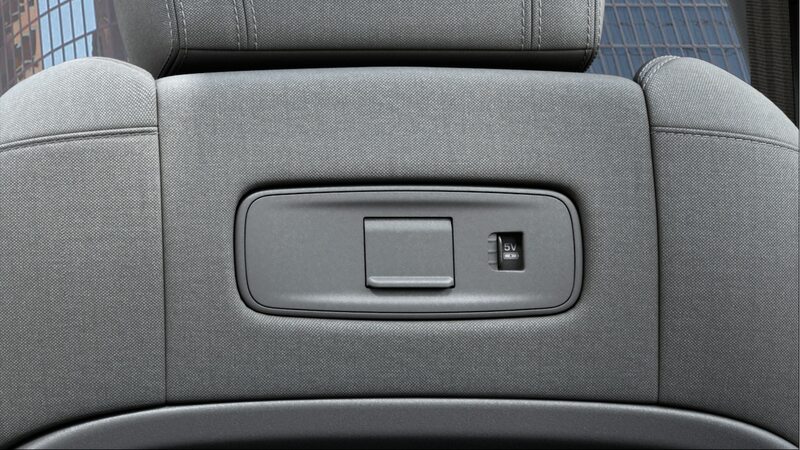 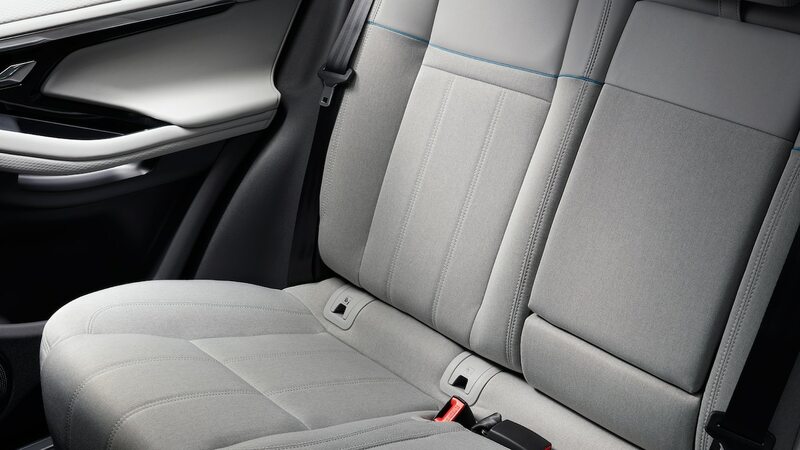 Extending the wheelbase doesn’t boost legroom in either row, though new front seat mounts improve rear foot room, and the revised rear seat position boosts knee-room. 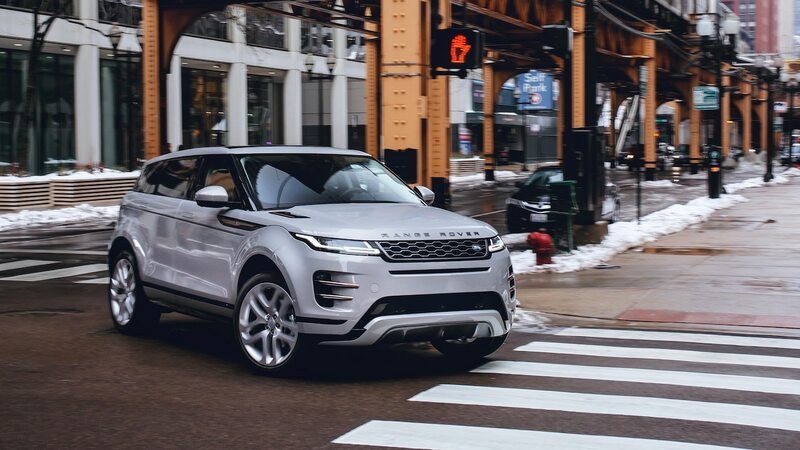 There’s nothing reductive about the drivetrain. 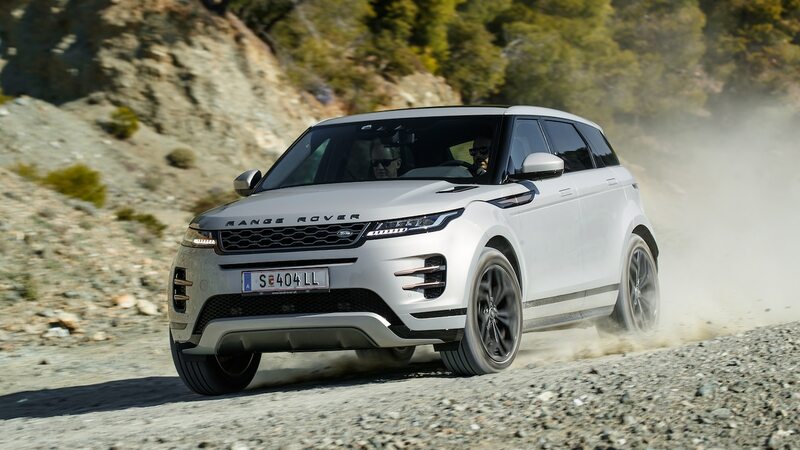 Both 2.0-liter turbos provide more output (9 hp and 18 lb-ft on the P250; 10 hp on the P300), and the engine mounts relocate to the engine’s torque axis. 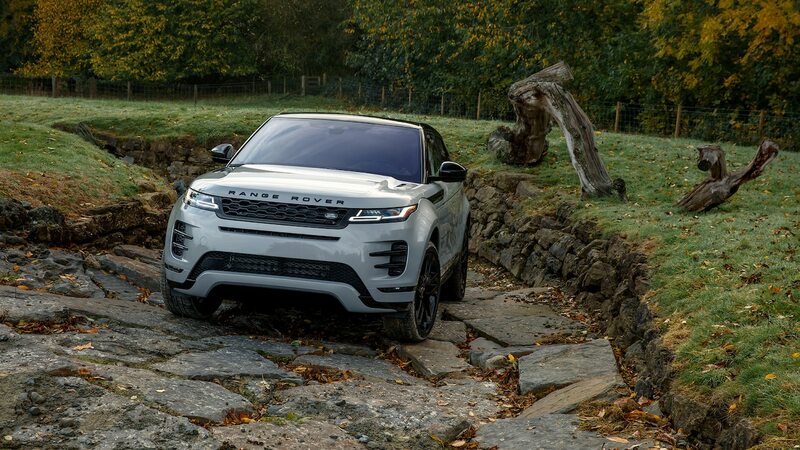 They used to hang the engine from above, requiring torque reduction during hard launches (which felt like turbo lag) to prevent the powertrain from swinging. 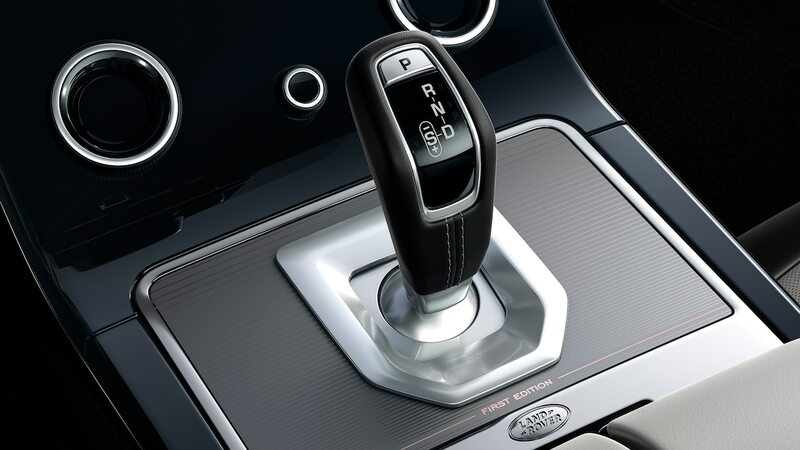 Upgrading to the newer 9HP50 nine-speed transmission brings improved shift programming devoid of the busyness and shift shock we complained about in our First Test, and savvier sport-mode gear selection. 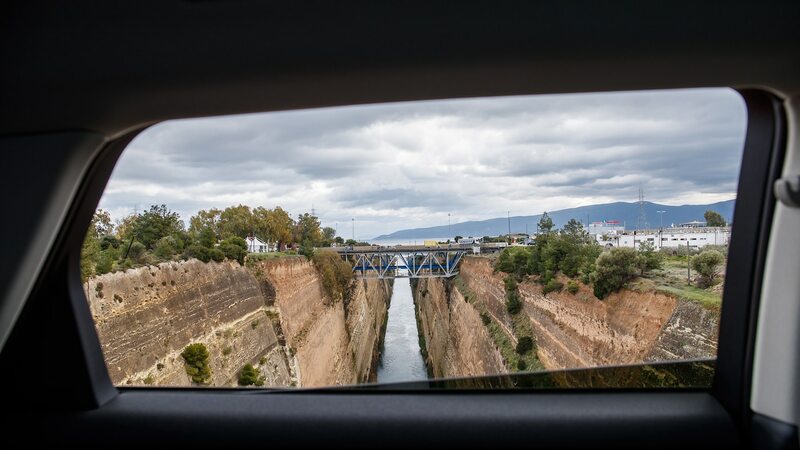 Ratios remain unchanged. 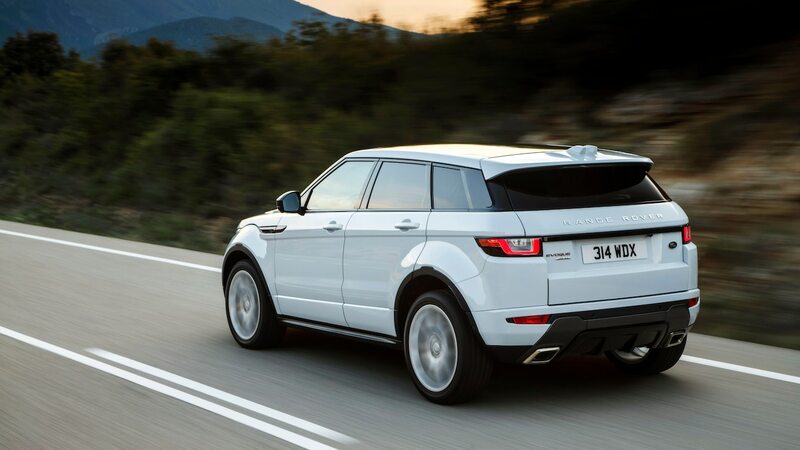 Two things that haven’t been reduced: weight and fuel consumption. 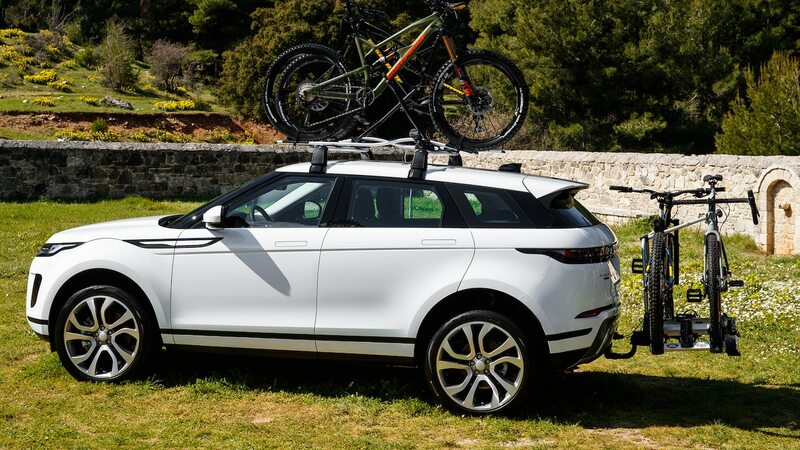 Despite use of aluminum for the hood and shock tower castings, magnesium for the dash support, and a switch to lighter brake rotors with pressed-steel centers, the longer wheelbase, improved rigidity, and new features like the fuel-saving 48-volt mild-hybrid system on the P300 R-Dynamic models add pounds. 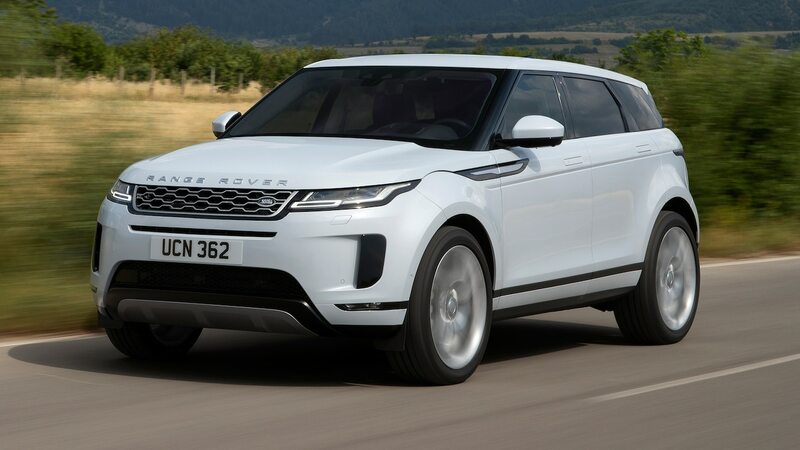 Sadly, neither the hybrid gear nor a reduction in drag coefficient from 0.36 to 0.32, nor even the switch to GKN’s latest prop-shaft-disconnecting Twinster all-wheel-drive system could prevent an EPA economy decline—combined ratings fall from 25 and 24 mpg (9.4 and 9.8 L/100 km) for the outgoing P250 and P300 to 23 mpg (10.2 L/100 km) for both 2020 models. 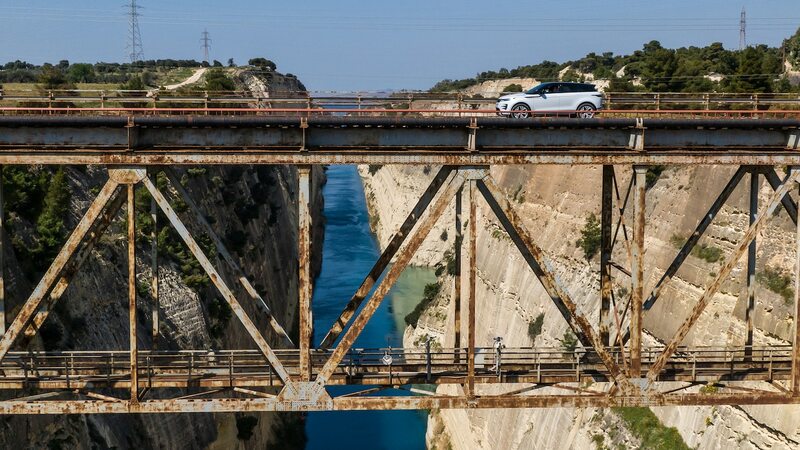 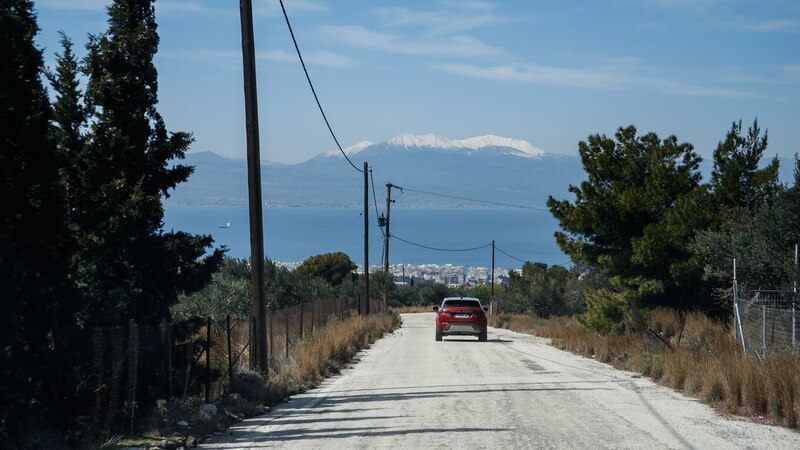 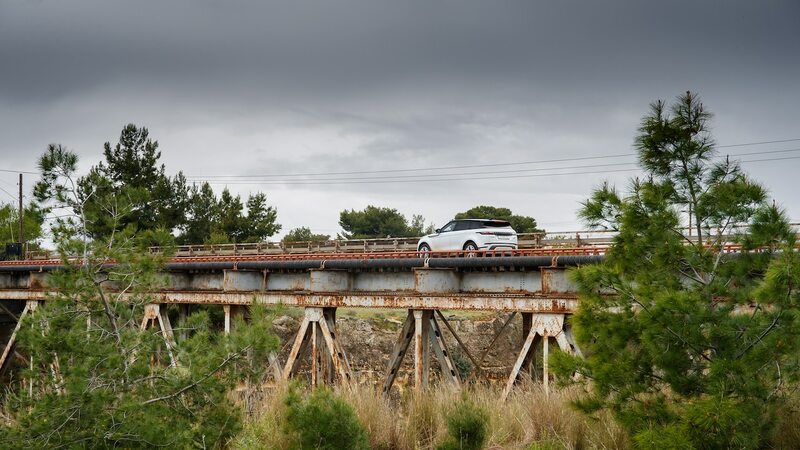 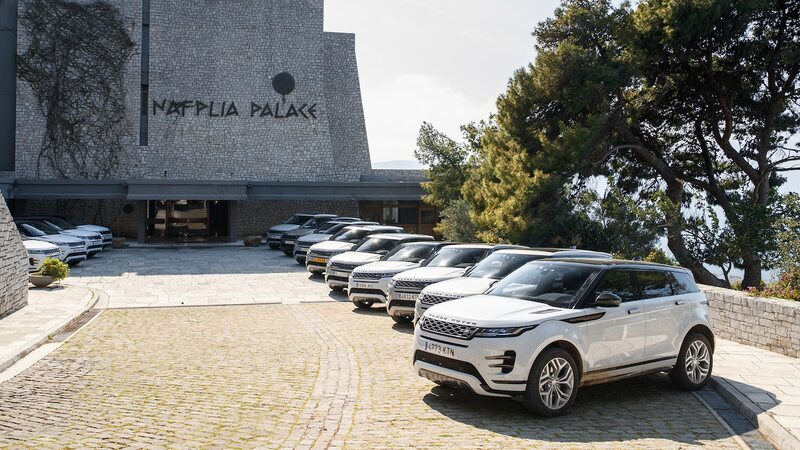 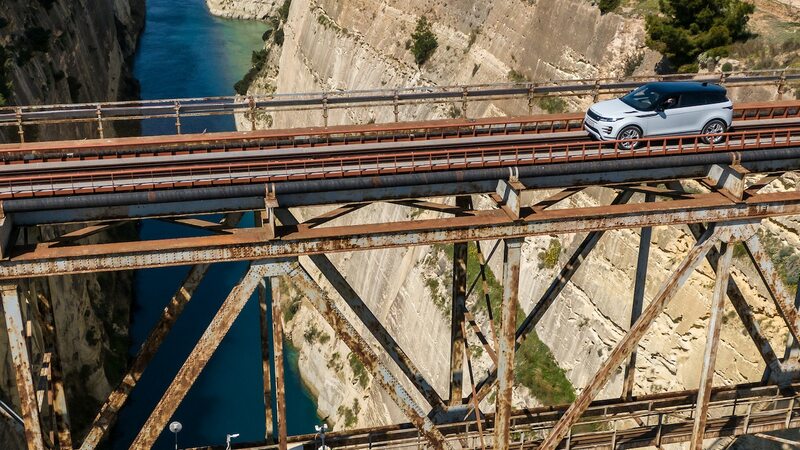 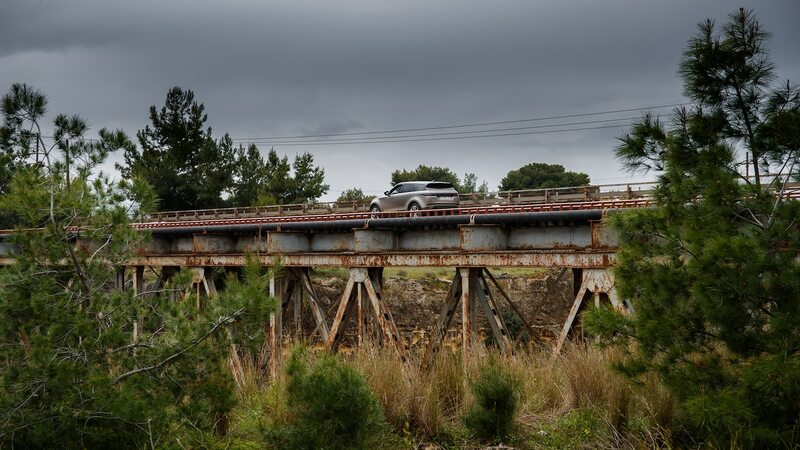 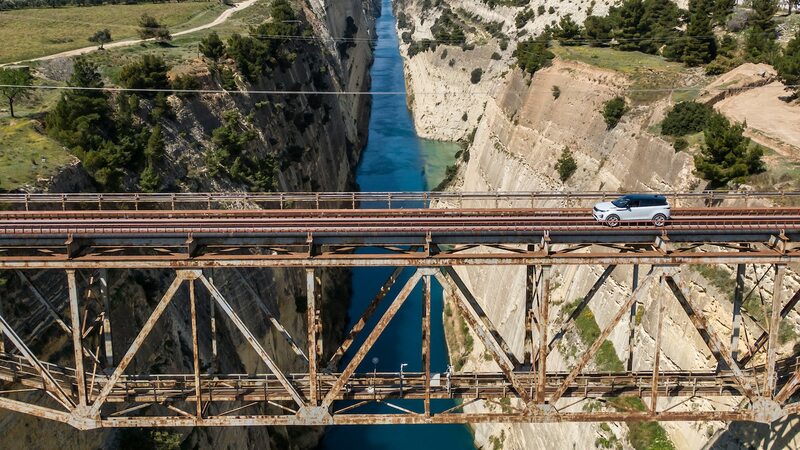 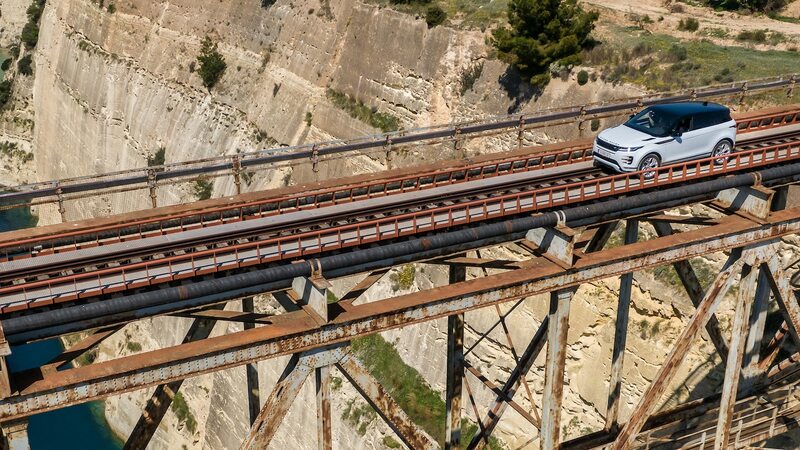 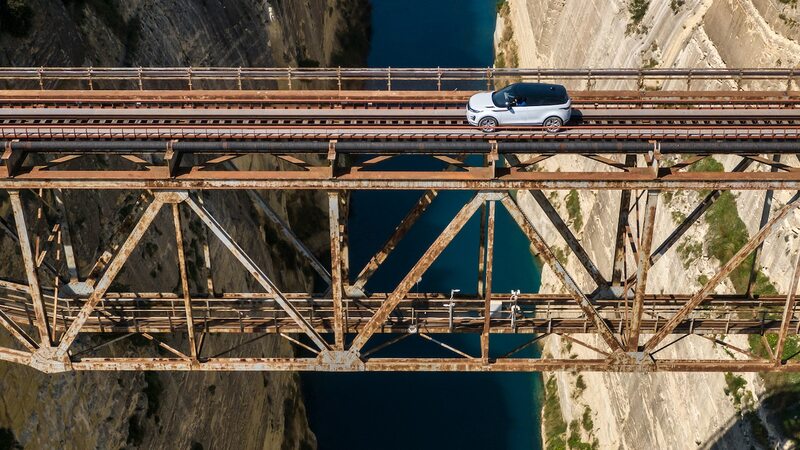 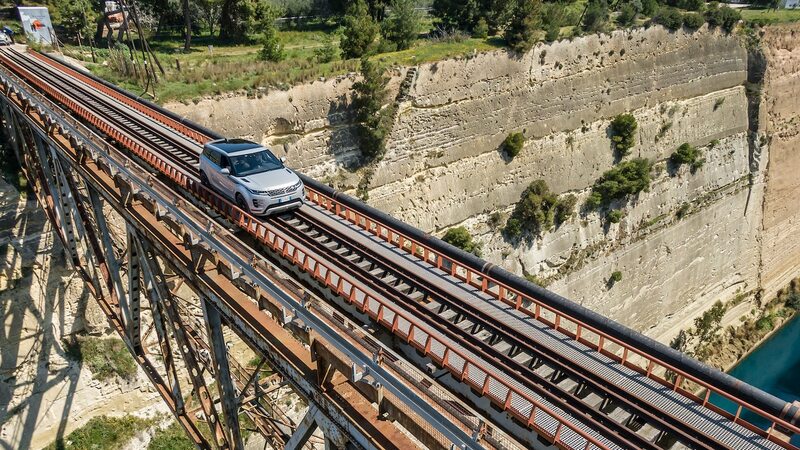 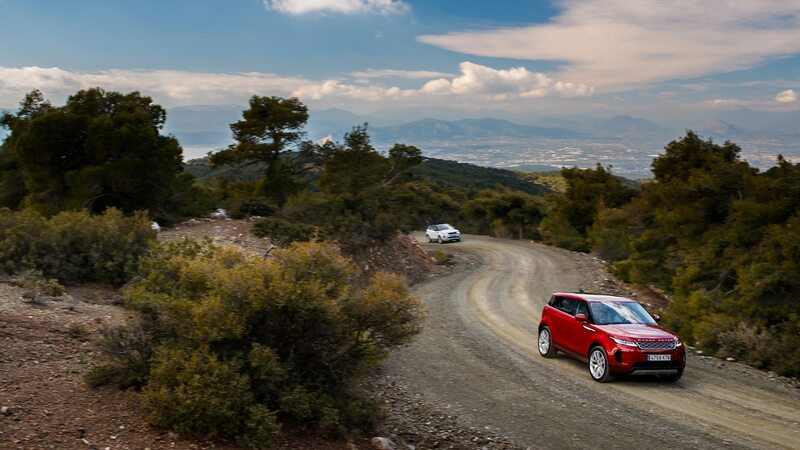 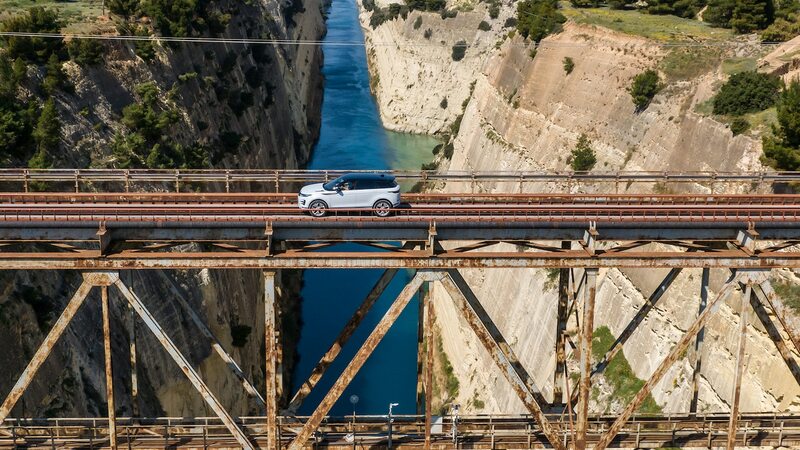 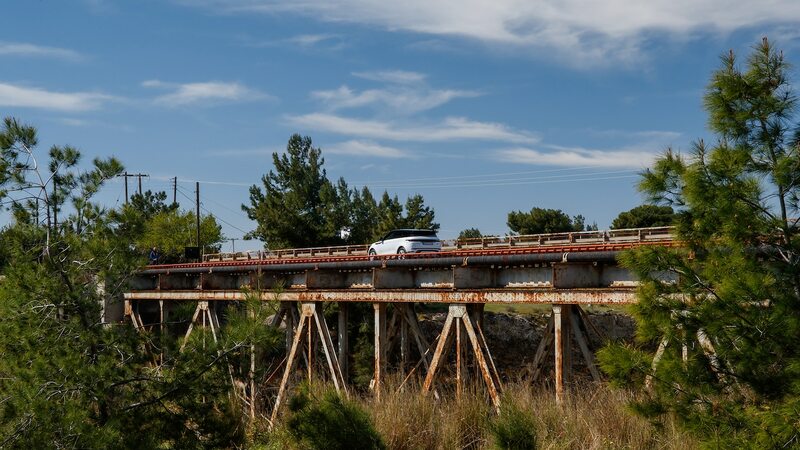 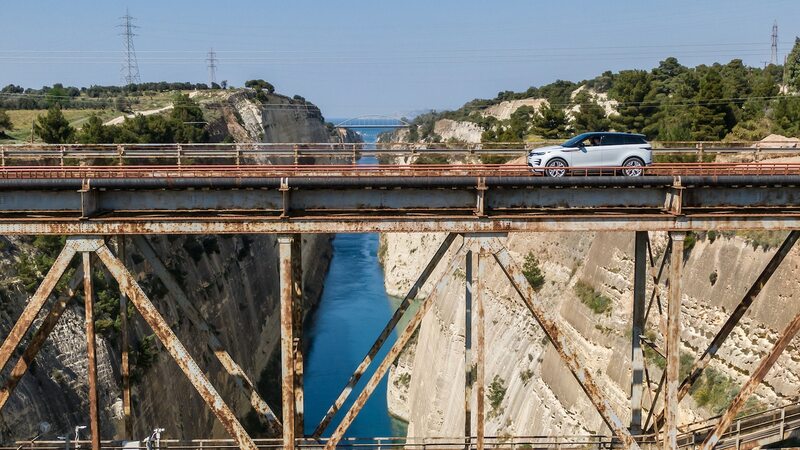 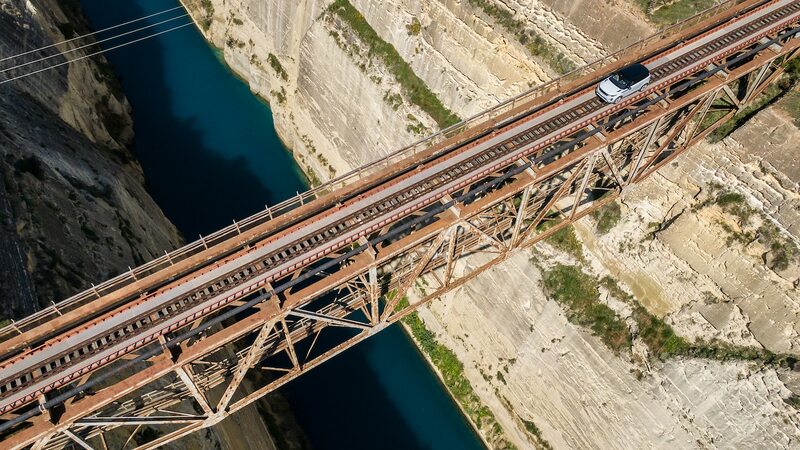 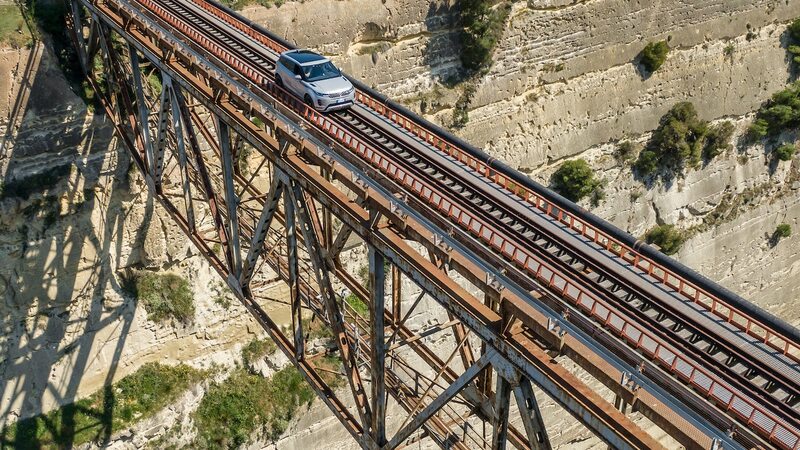 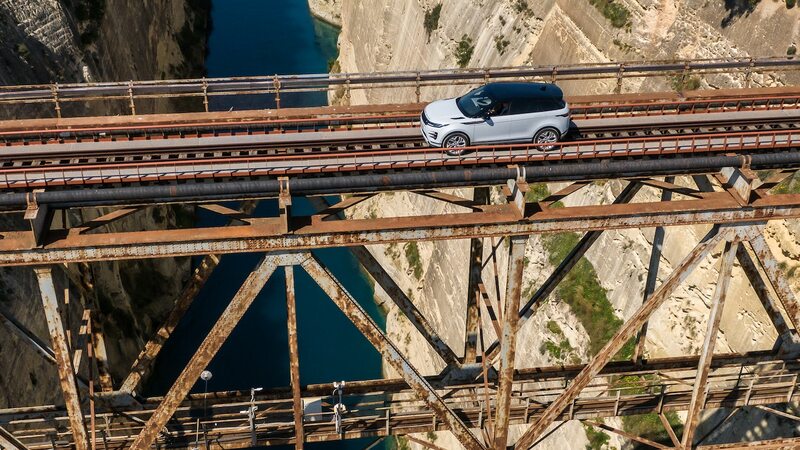 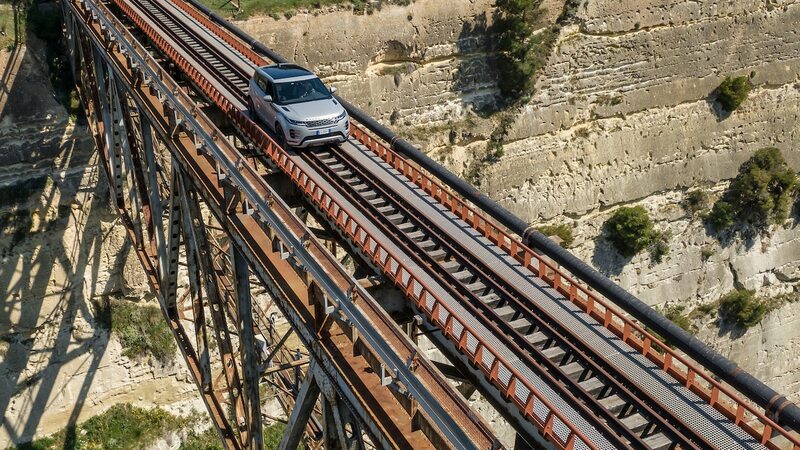 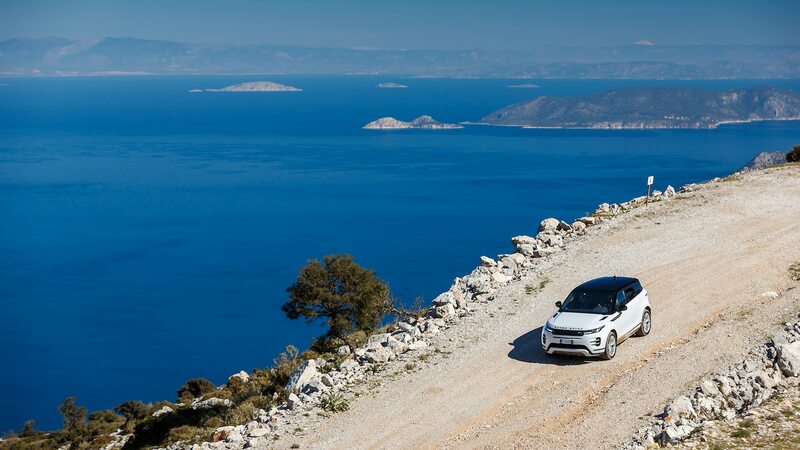 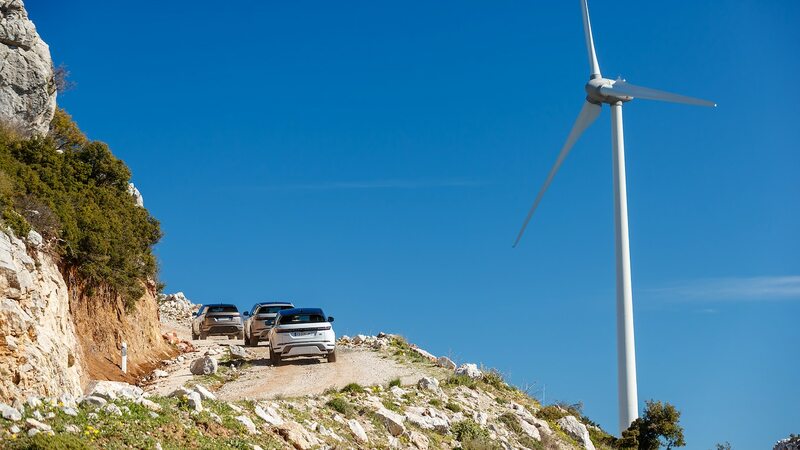 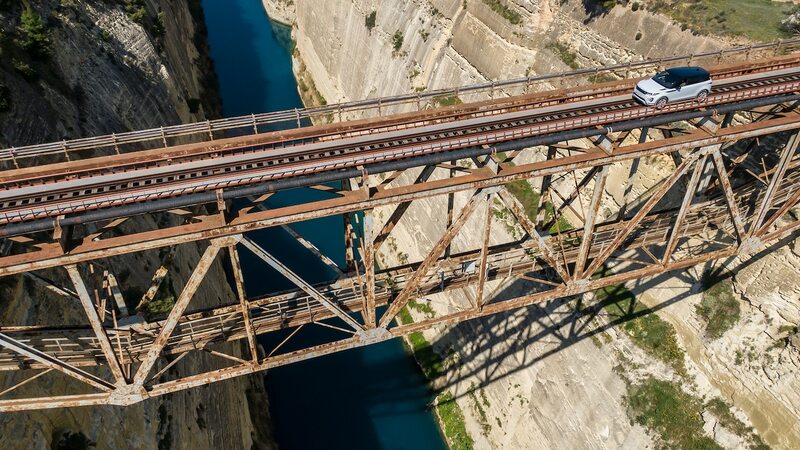 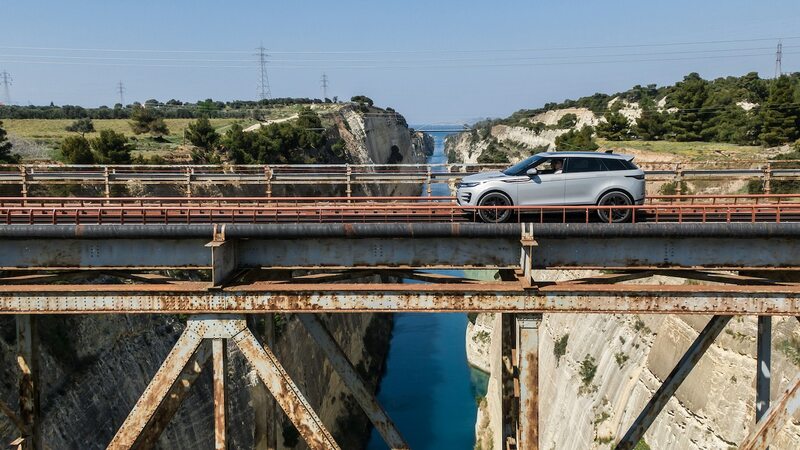 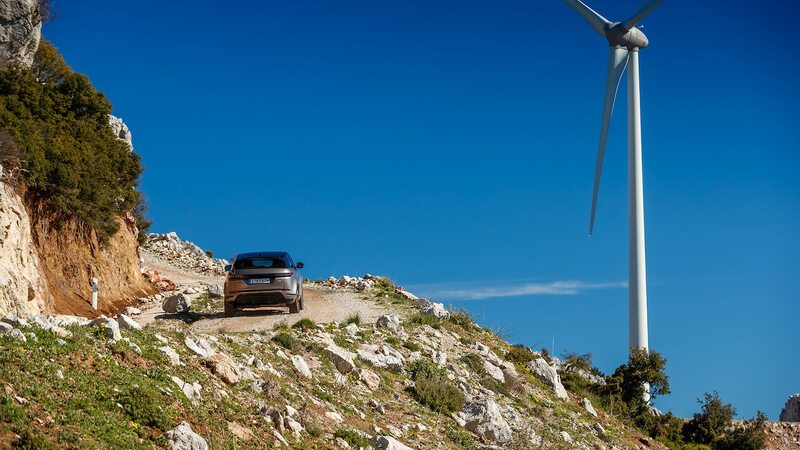 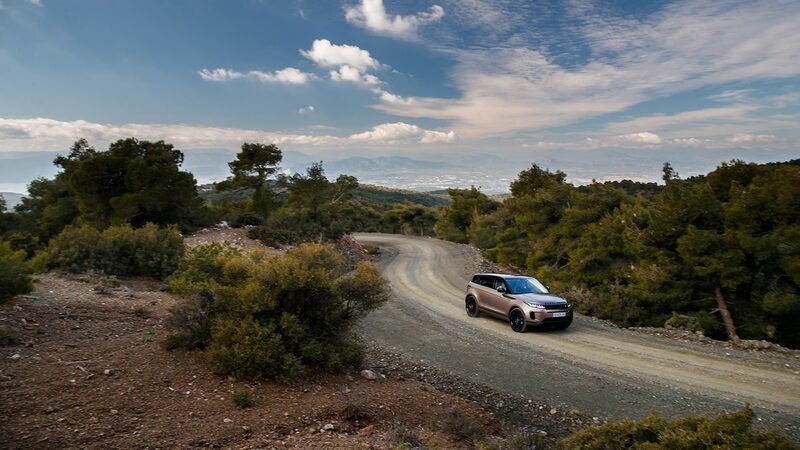 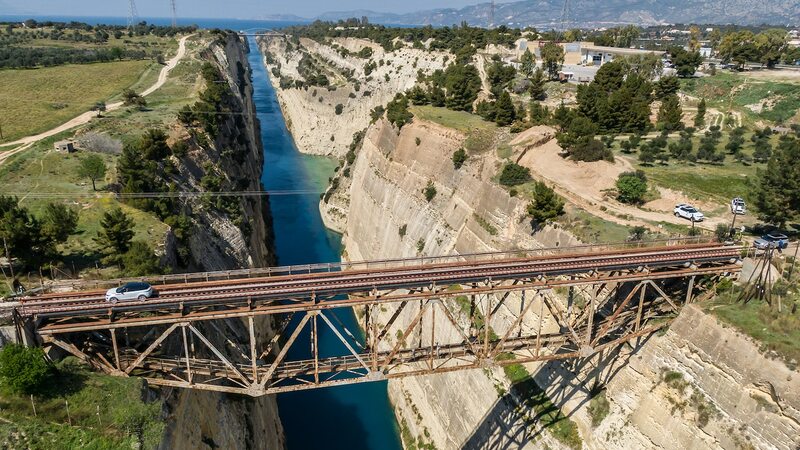 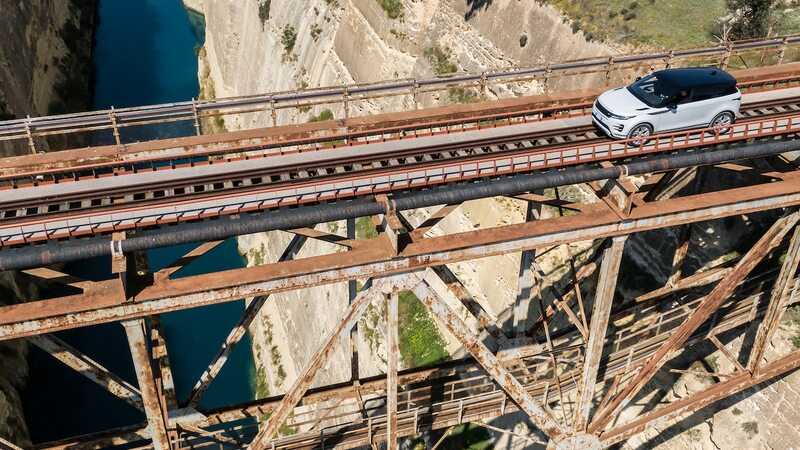 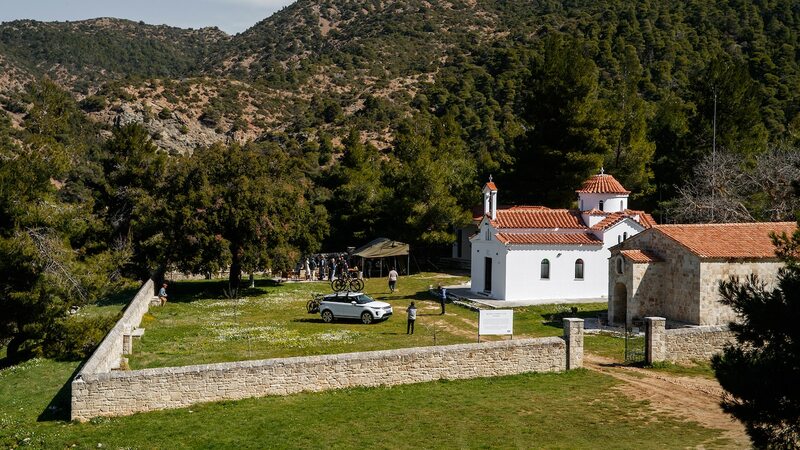 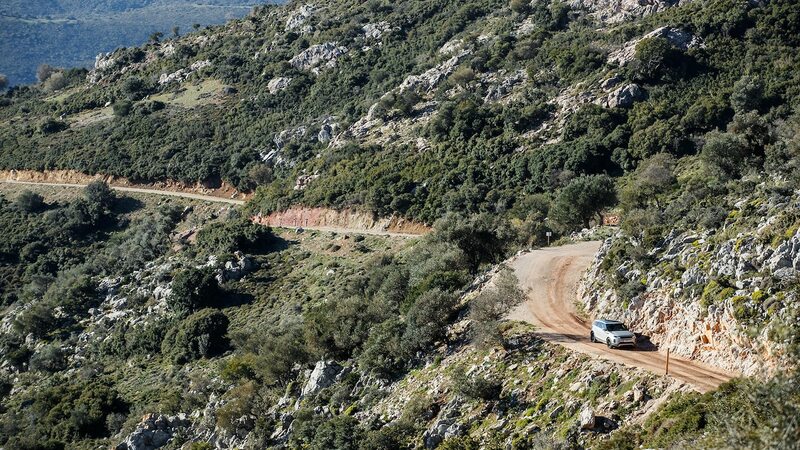 To demonstrate that the improvements warrant this small fuel economy penalty (and modest $850 USD bump in the base price), Land Rover invited us to the cradle of democracy and Olympic competition—the Peloponnese peninsula in Greece. 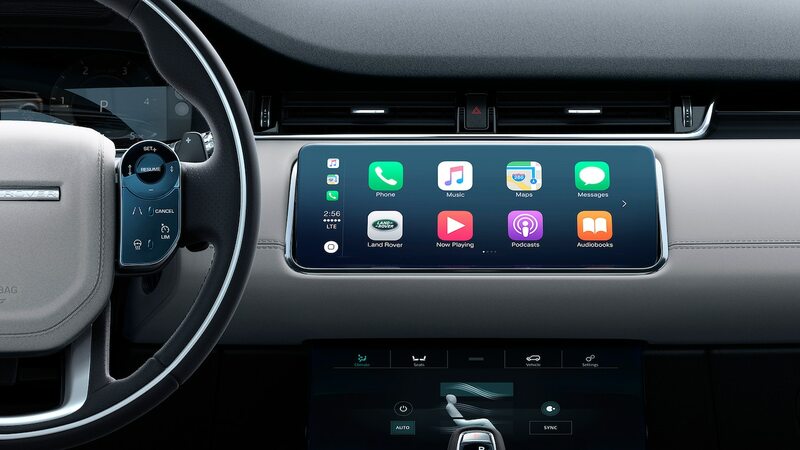 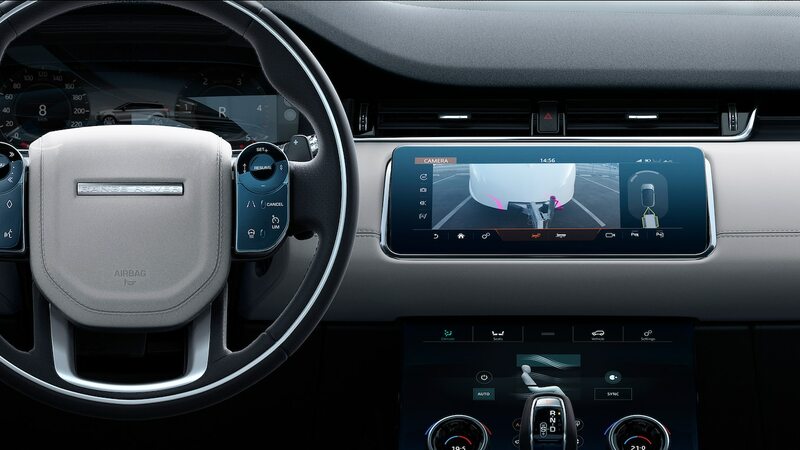 The new ClearSight Ground View system, which uses grille- and mirror-mounted cameras to generate an image of the terrain passing by the tires at speeds below 15 mph (24 km/h), produces an image that looks like a window down through the dash and firewall. 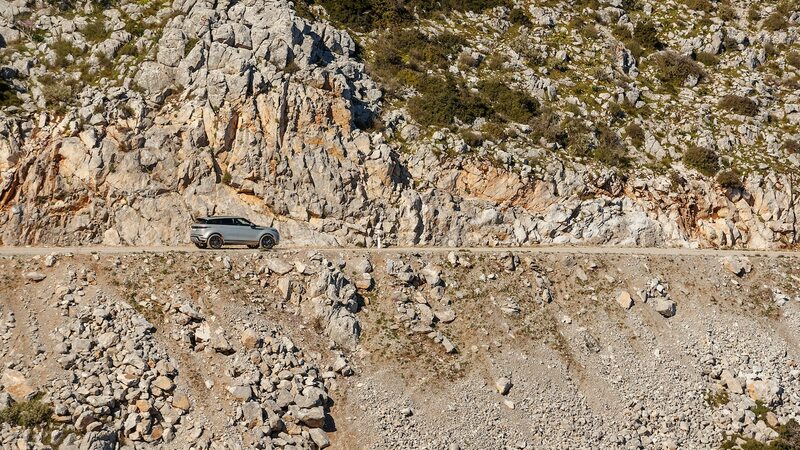 It’s great for navigating blind drop-offs or hill crests. 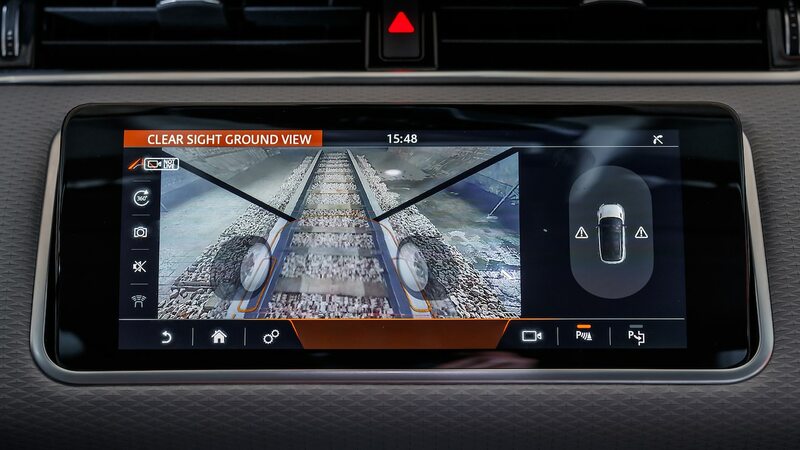 The related ClearSight Rear View mirror provides an ultra-crisp 1,600 x 320 resolution that is easier for the eyes to refocus on than the lower-resolution first-gen cam-mirrors on GM and Nissan vehicles. 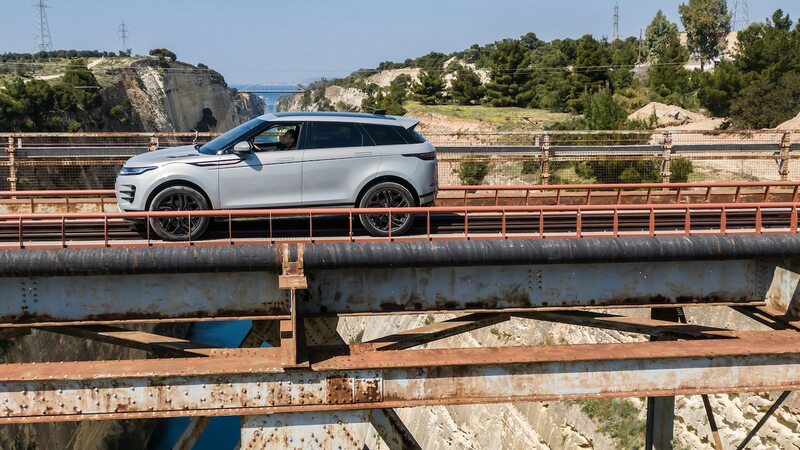 The image stays remarkably clean thanks to a hydrophobic lens coating and a mounting positioning up in the “shark fin” roof antenna. 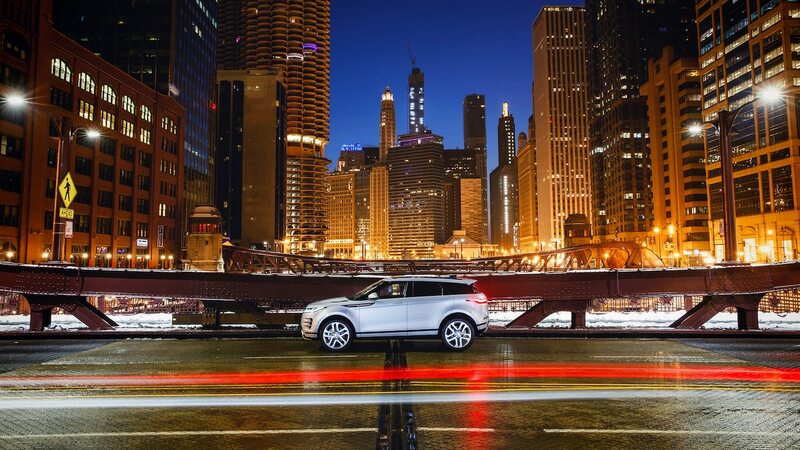 Our test vehicles were Euro-spec P250s, outfitted with the MHEV system and R-Dynamic S trim—two features we’ll only get on P300 models—so U.S.-spec cars may not enjoy the brisk launch feel these Evoques demonstrated. 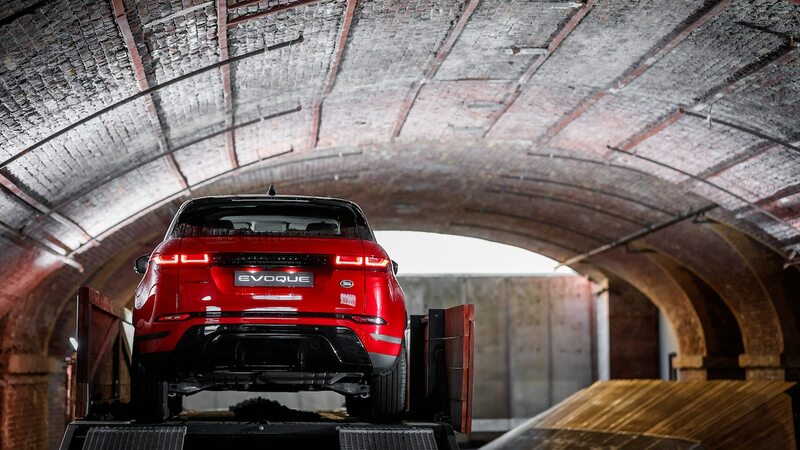 We’ll certainly get the same flat cornering attitude and eager turn-in afforded by the torque-vectoring rear axle. 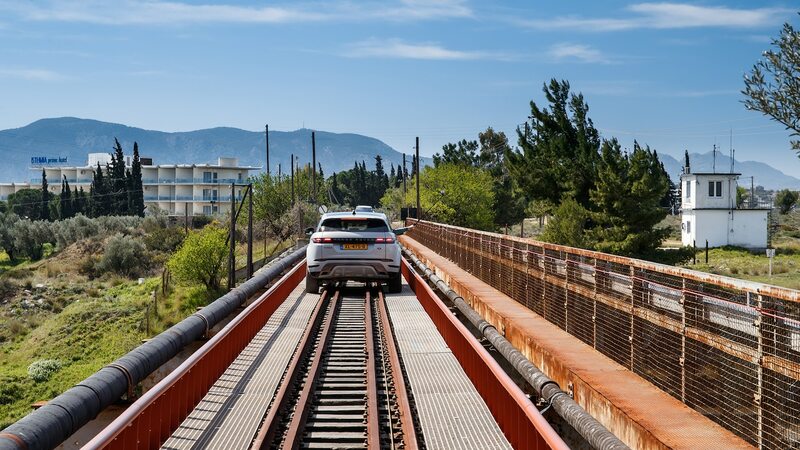 This system doesn’t overspeed the outside rear wheel in a turn like Acura’s SH-AWD does, but figure-eight testing indicates measurable handling benefits of such systems. 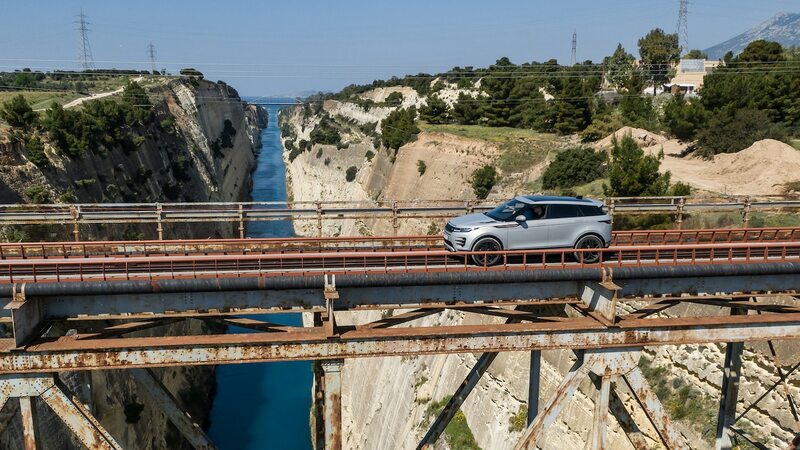 The cabin remained impressively conducive to conversation, even with the pano-roof uncovered at 80 mph (129 km/h). 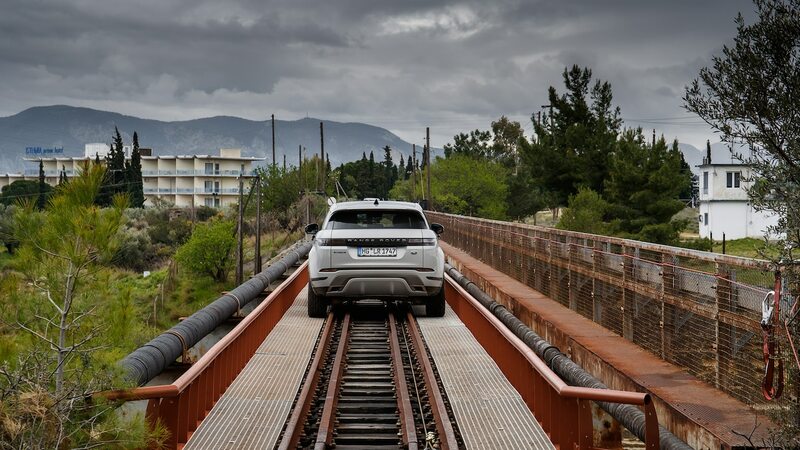 And a rainy day on scary-slick Greek tarmac revealed a stability control system willing to allow savvy drivers a gentle slide or two. 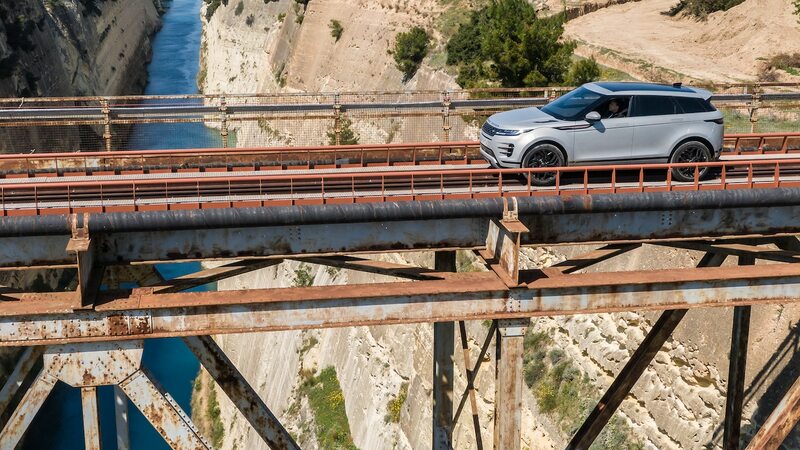 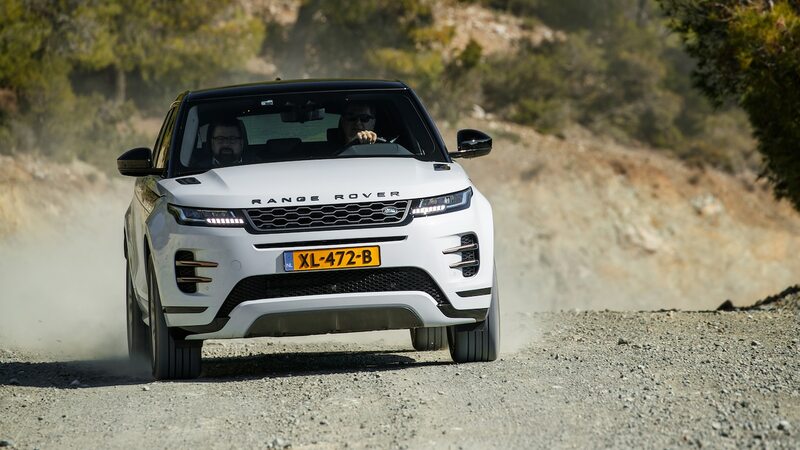 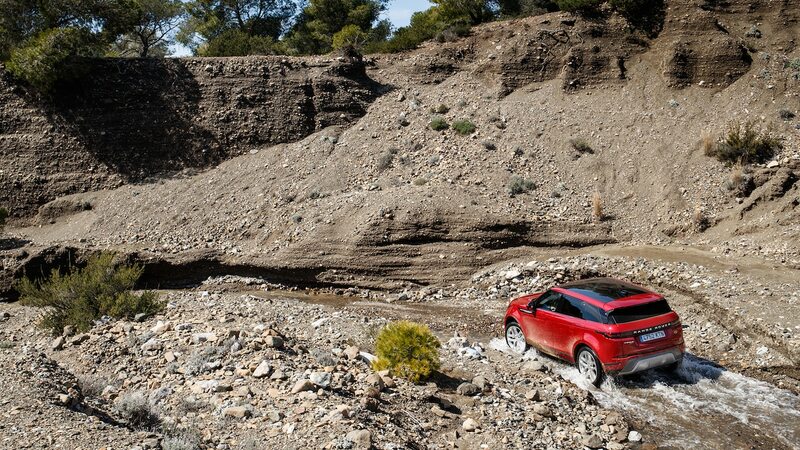 There’s nothing reductive about the new Evoque’s off-road chops. 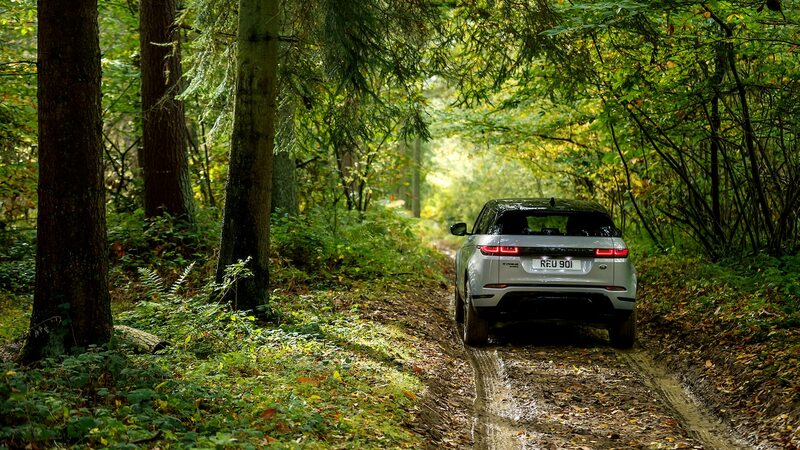 New this year is the Terrain Response2 system, which adds an “auto” setting that monitors a vast array of sensors to infer and optimize for changing conditions—great for trails that might otherwise require switching between the Sand; Grass, Gravel & Snow; or Mud & Ruts programs. 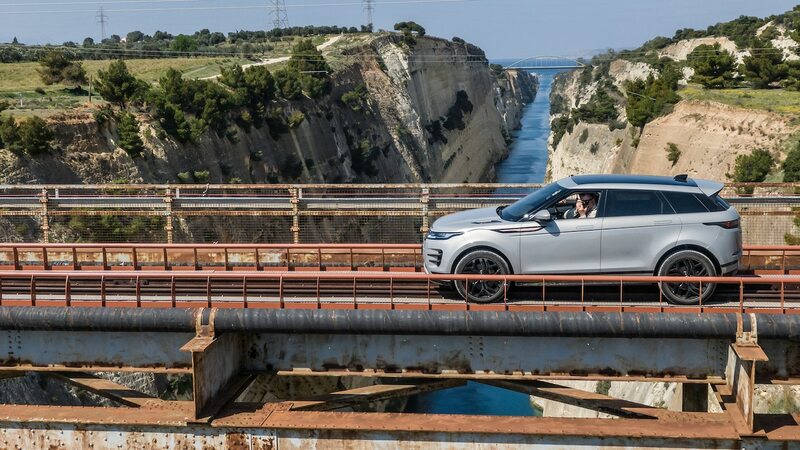 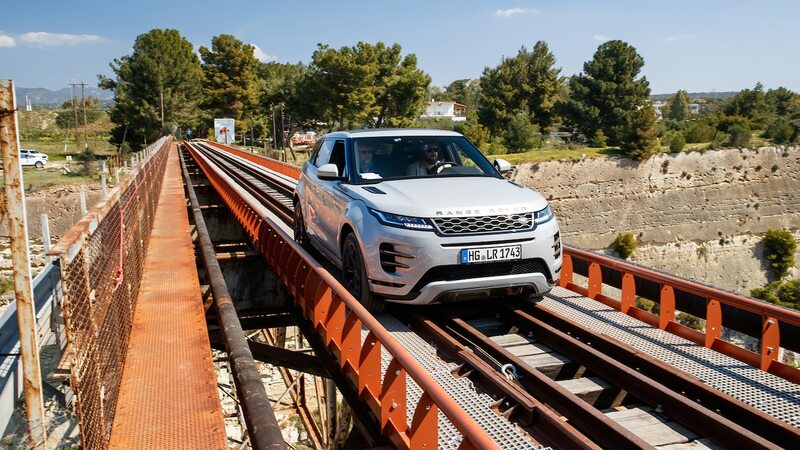 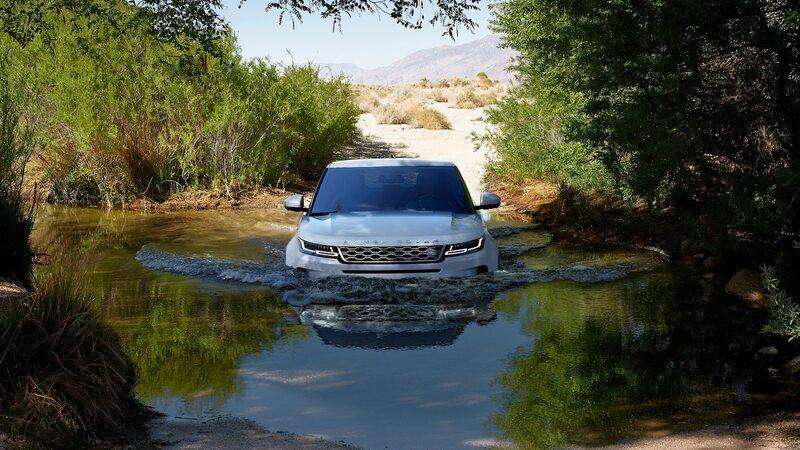 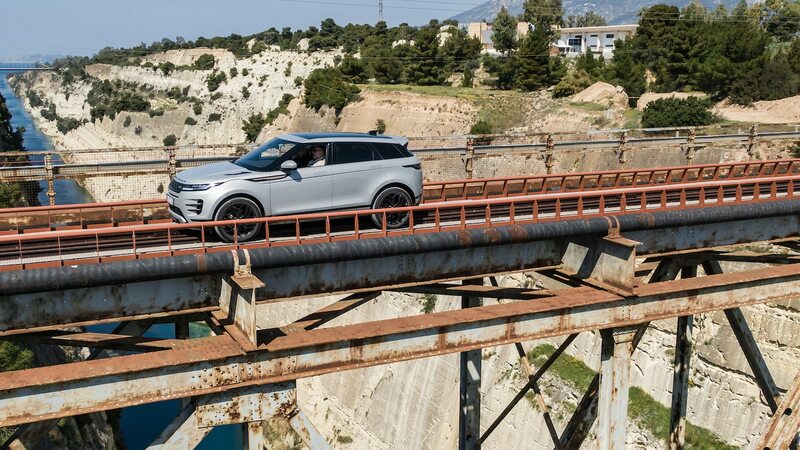 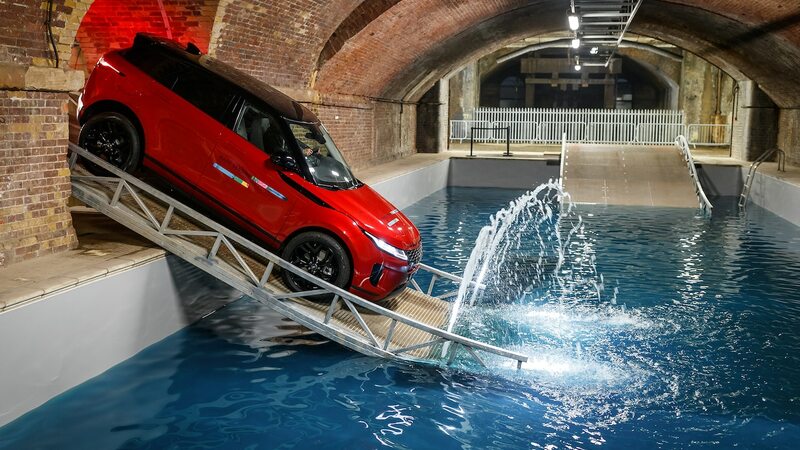 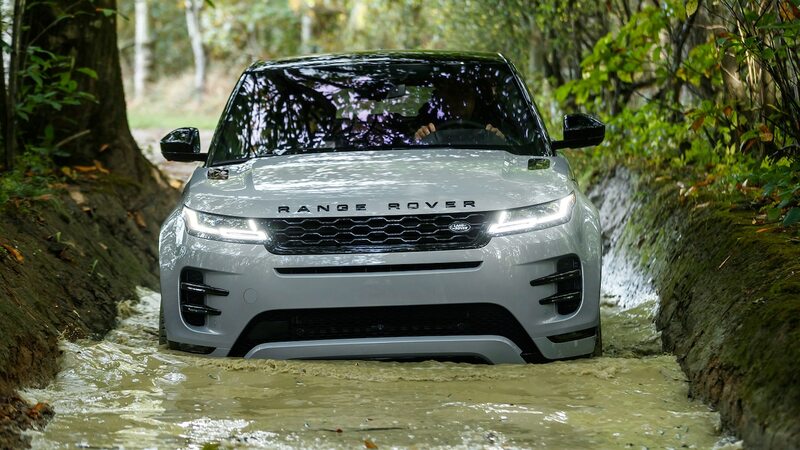 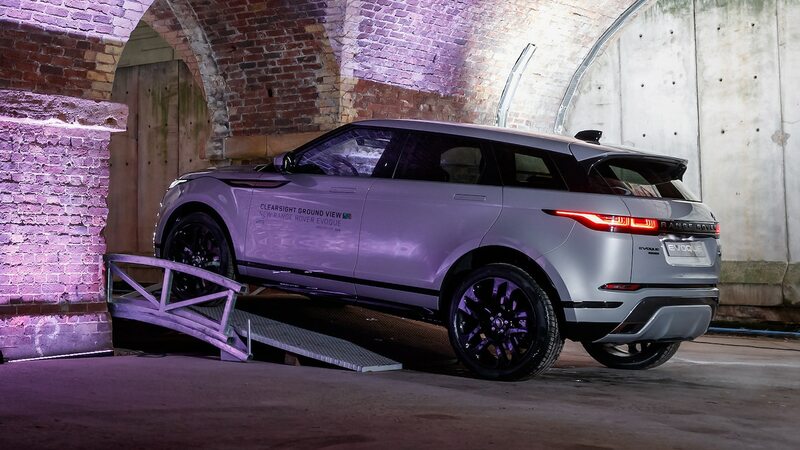 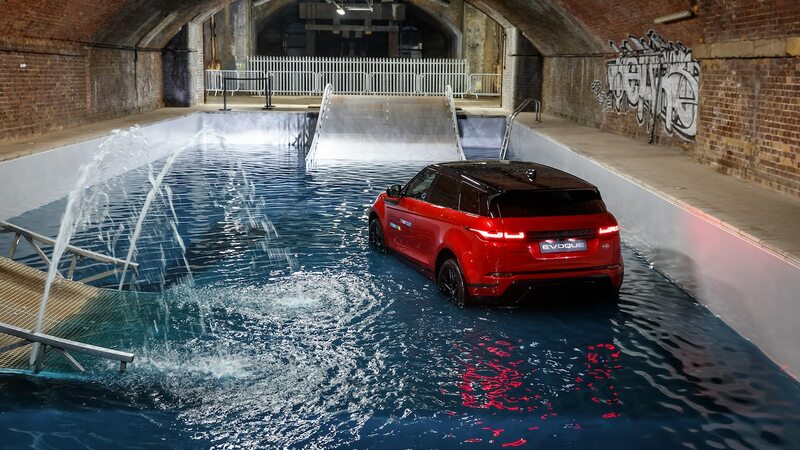 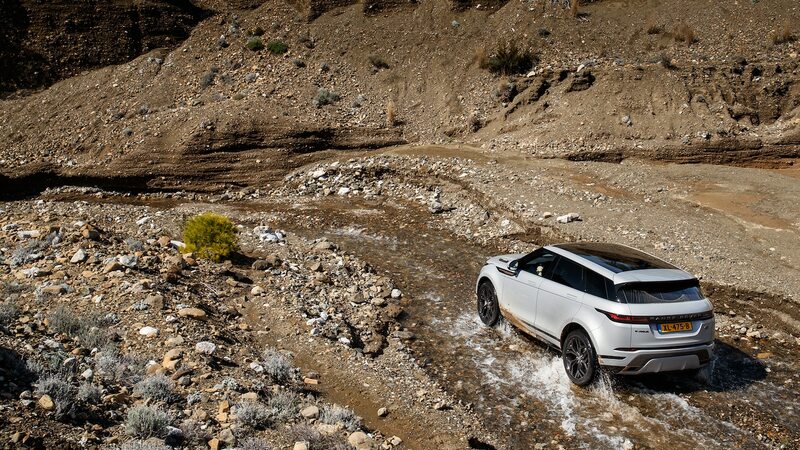 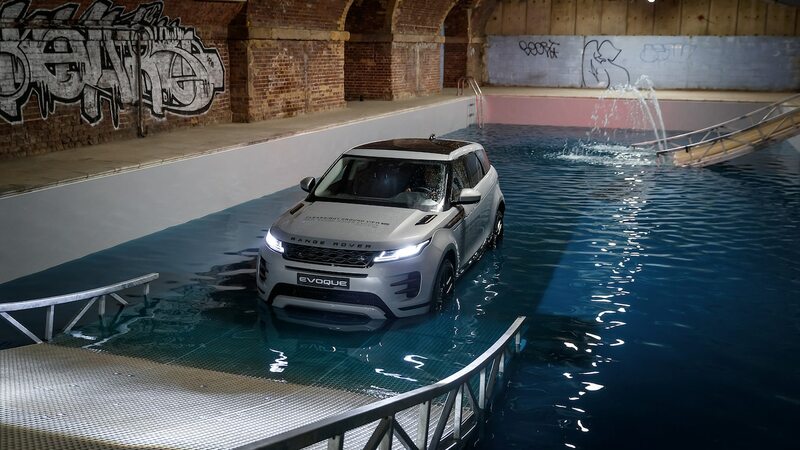 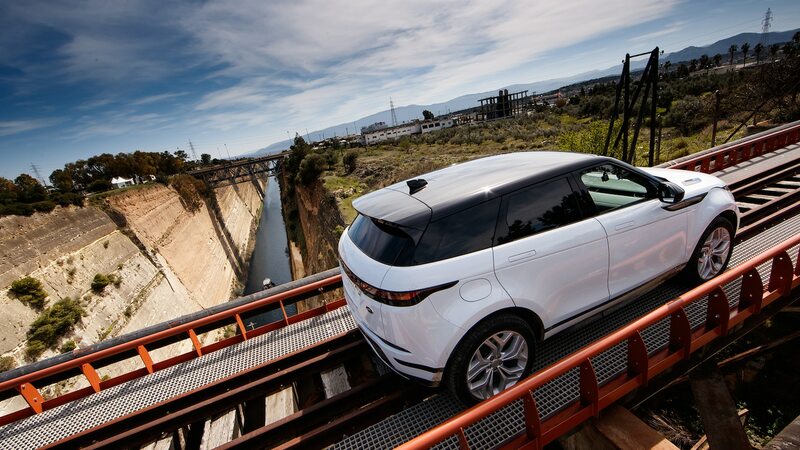 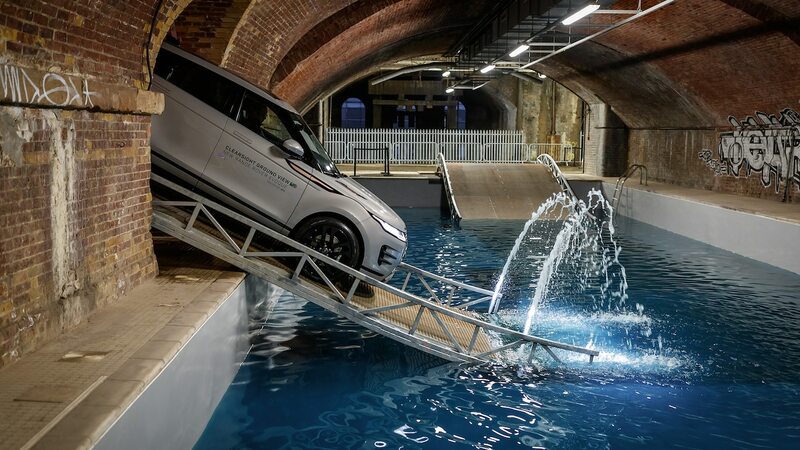 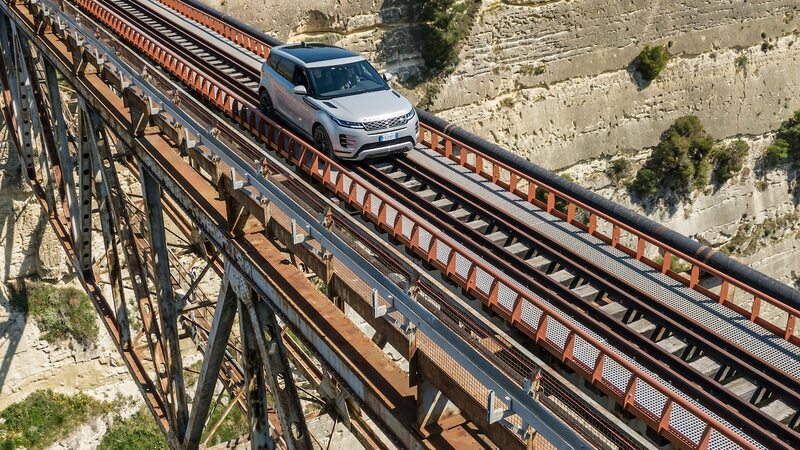 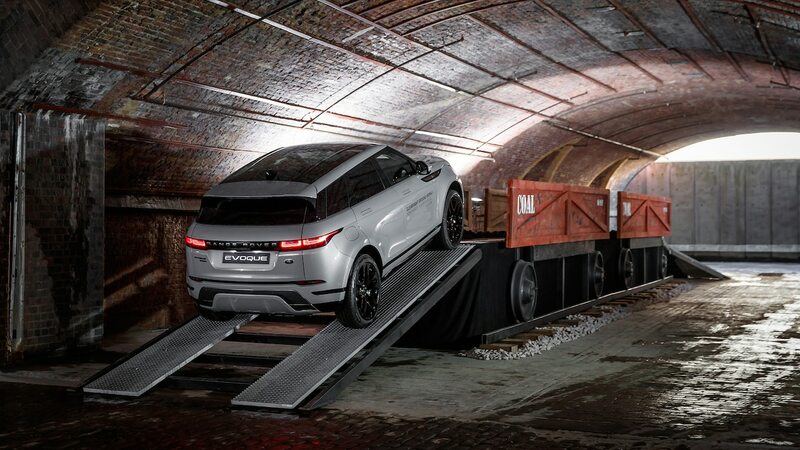 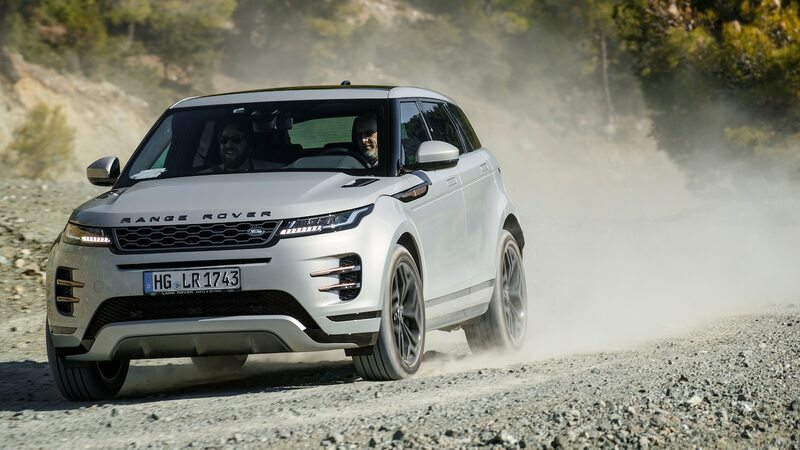 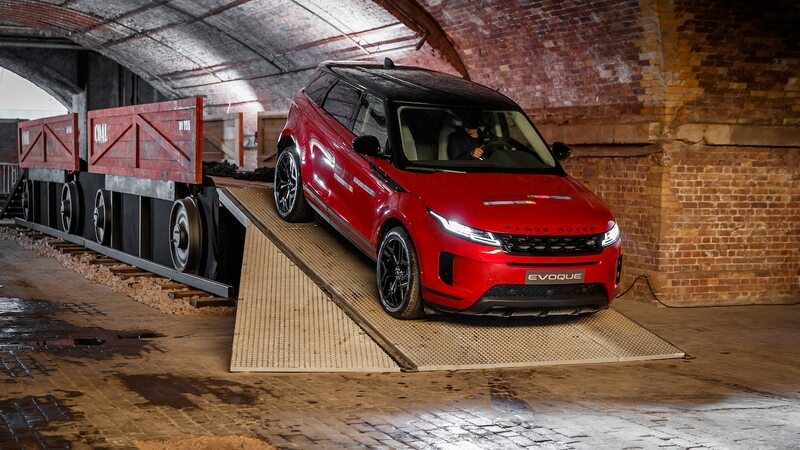 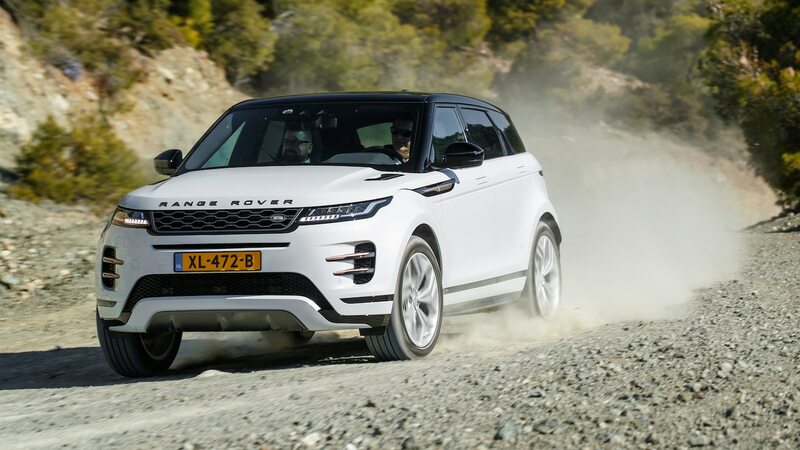 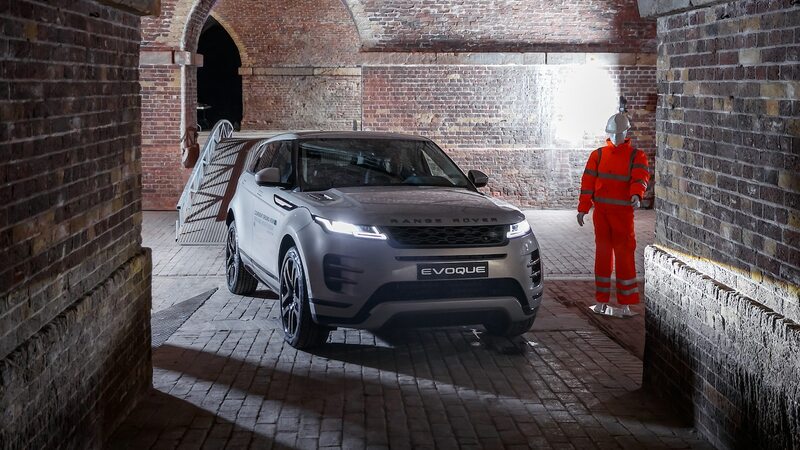 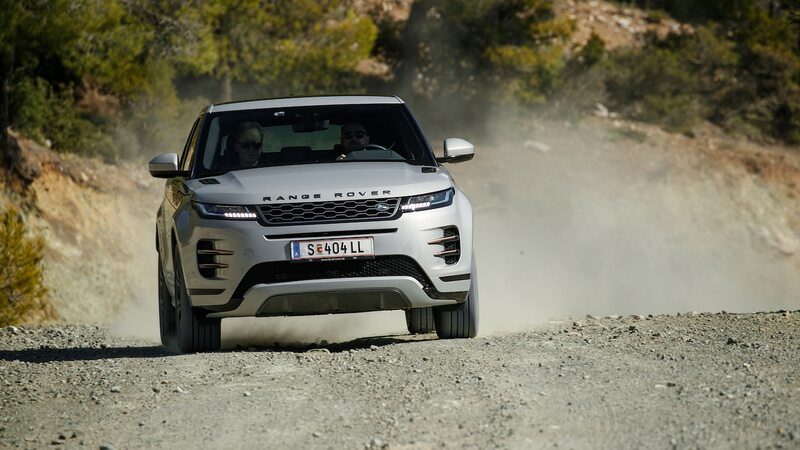 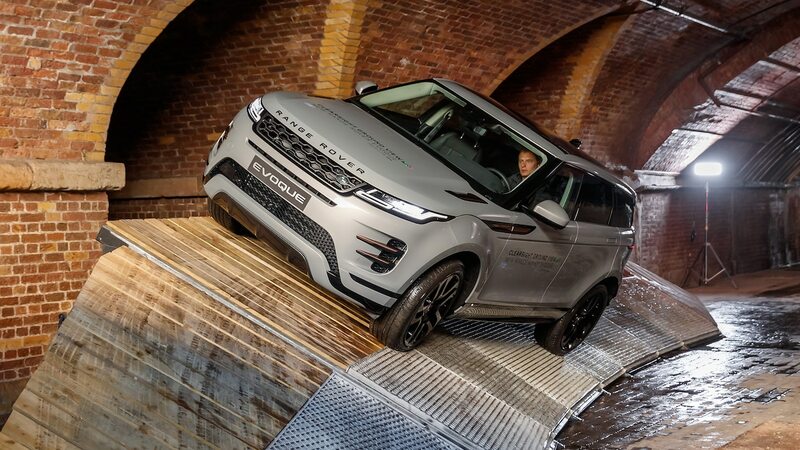 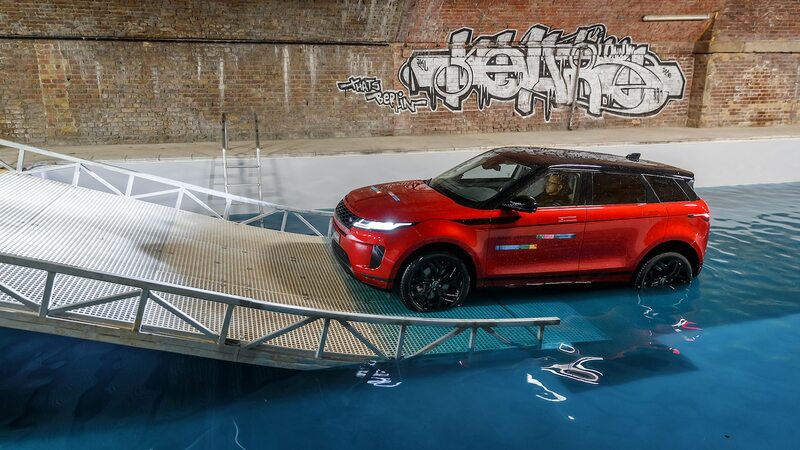 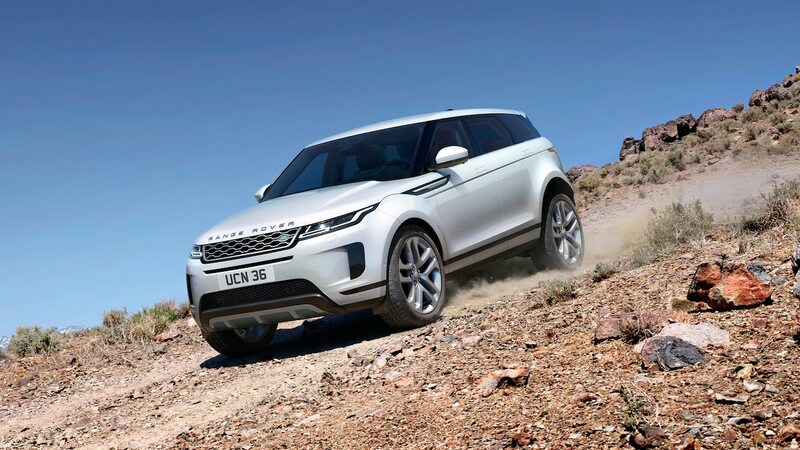 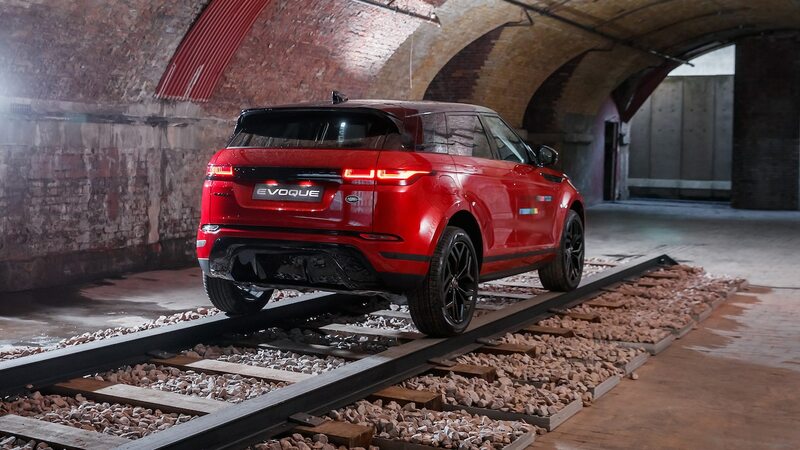 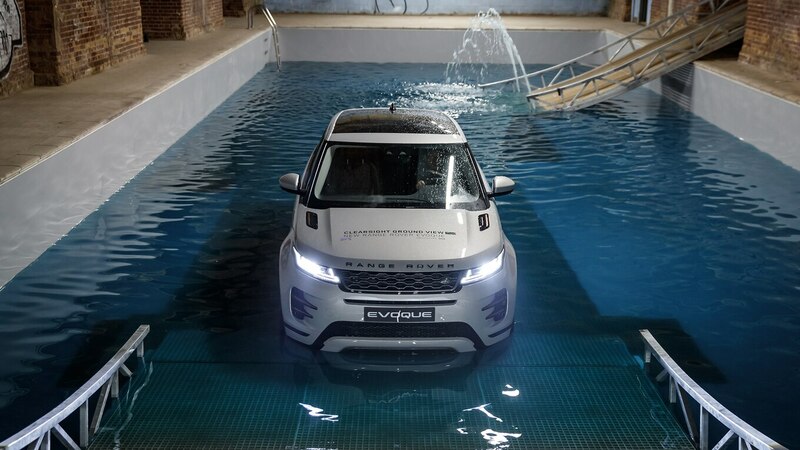 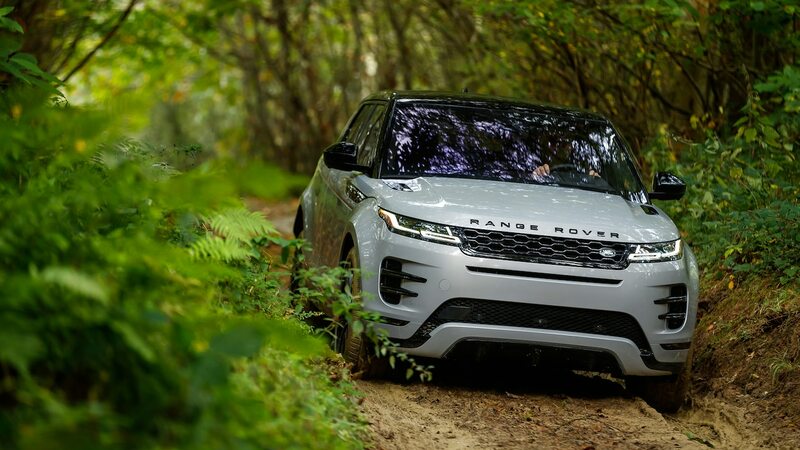 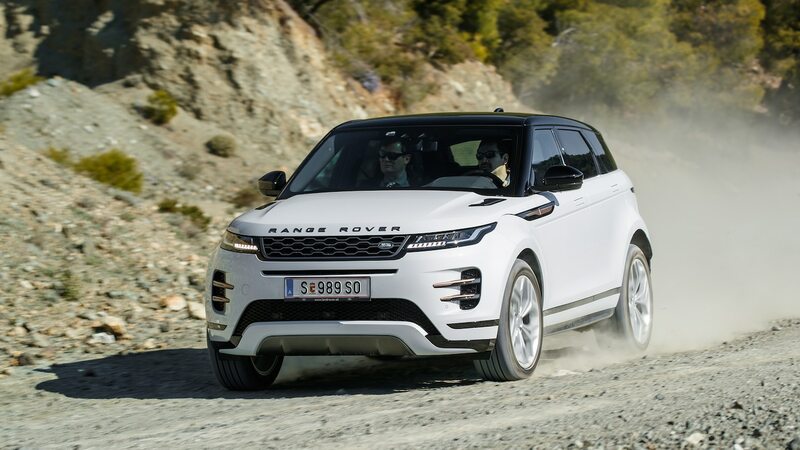 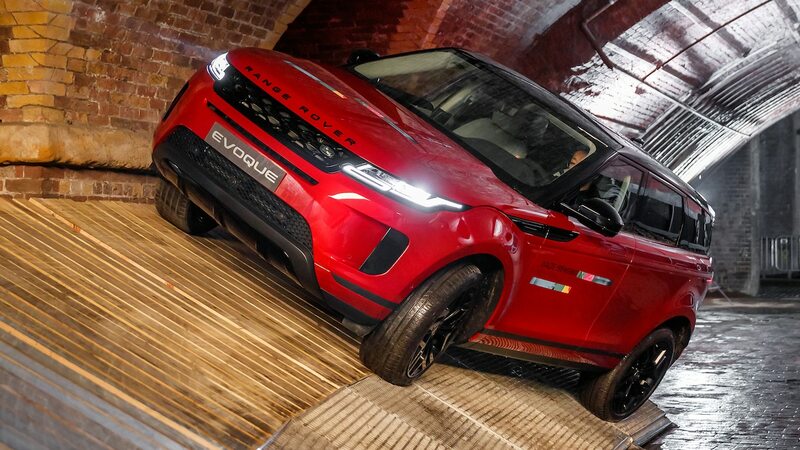 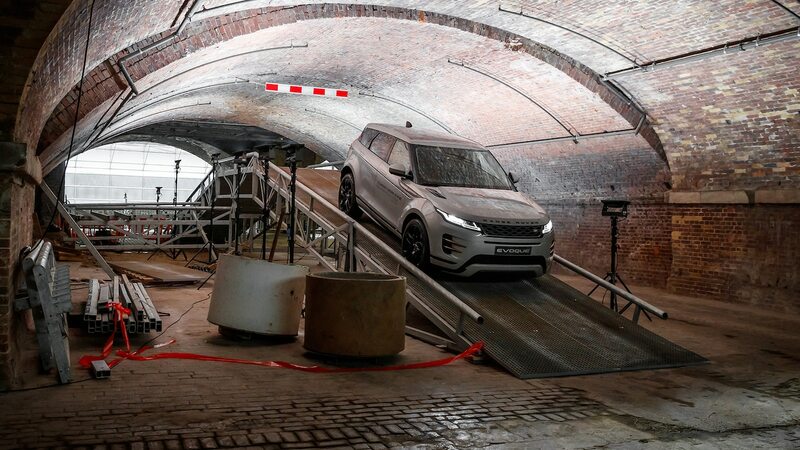 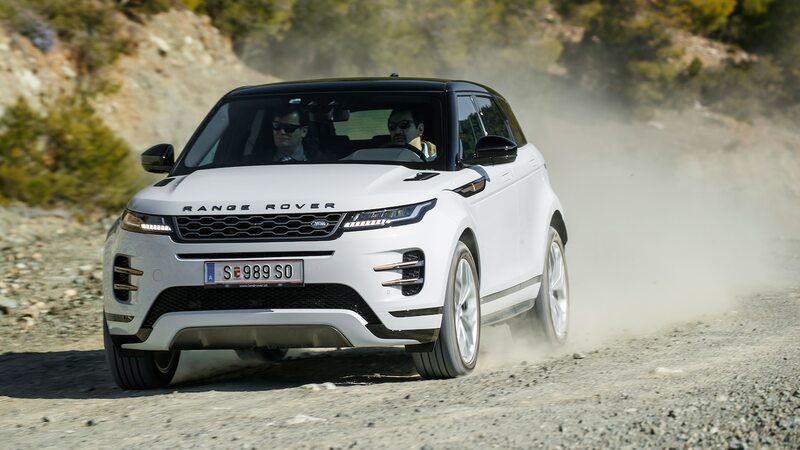 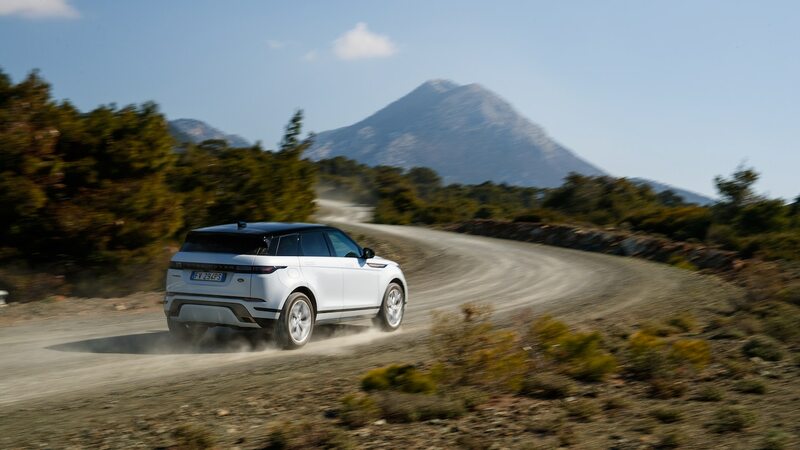 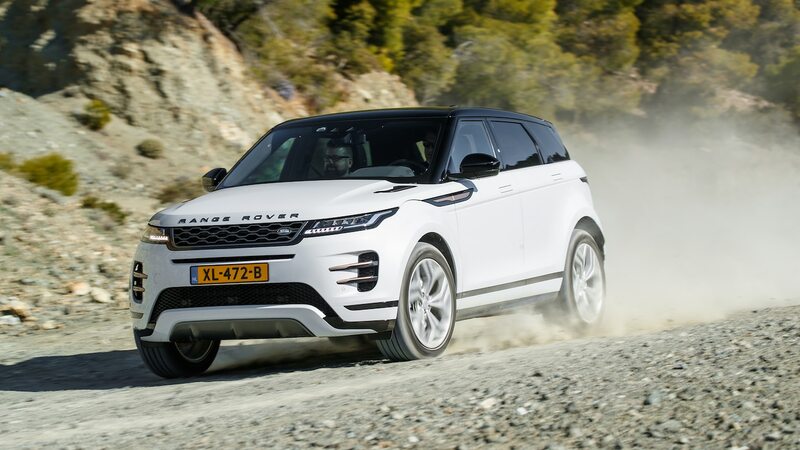 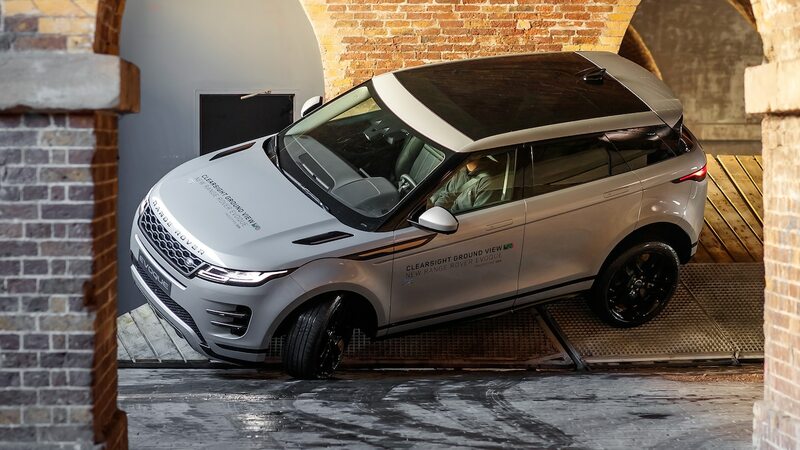 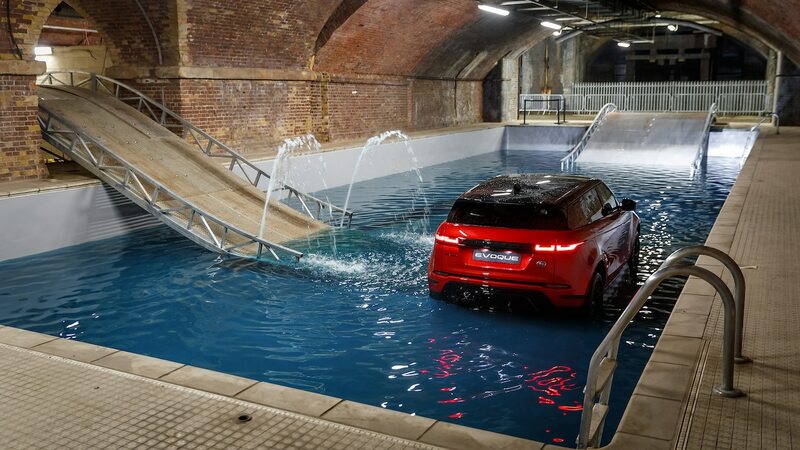 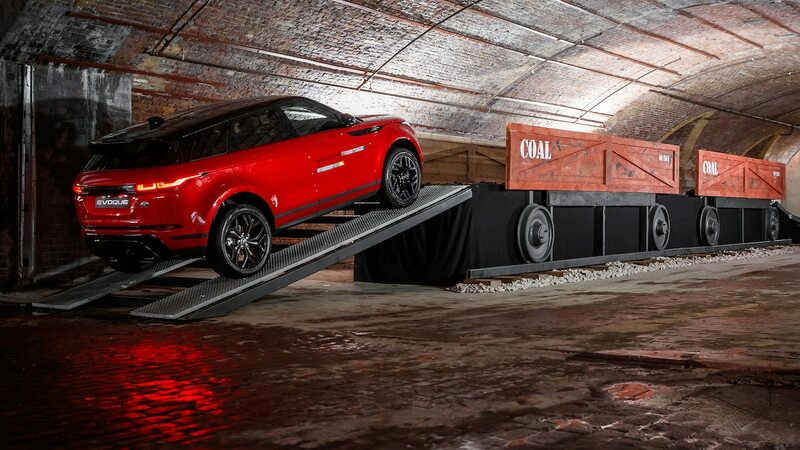 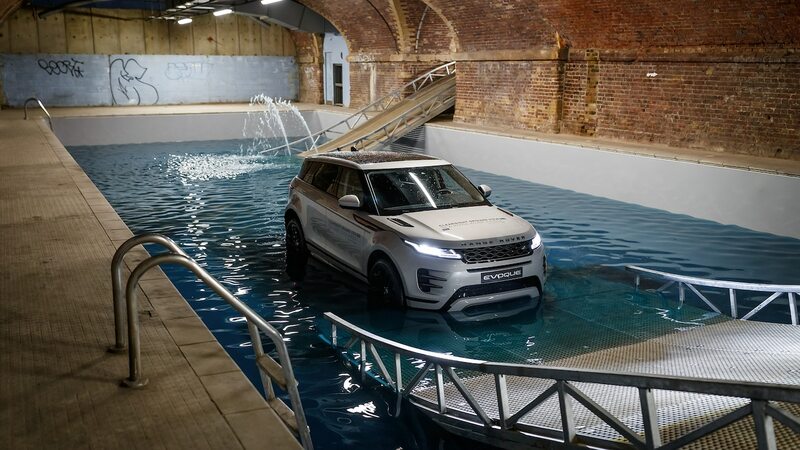 Surmounting off-road obstacles designed for the Evoque’s reduced suspension articulation (relative to senior Rovers) and modest street-tire grip, the Evoque acquitted itself admirably and demonstrated the advantages of its twin-clutch rear axle. 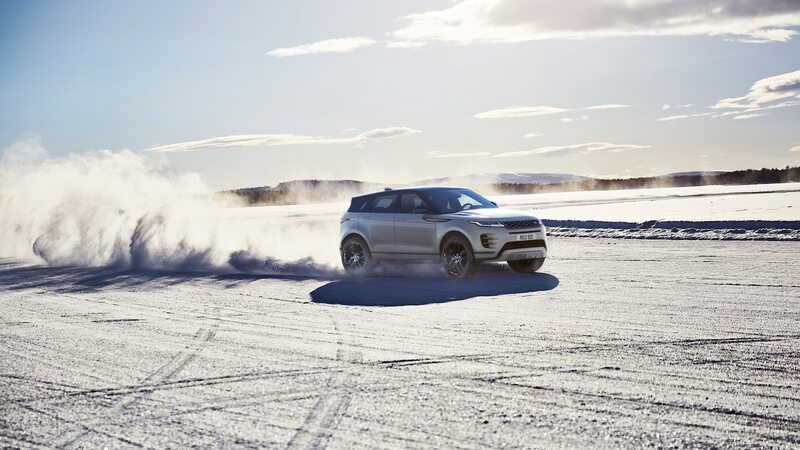 With no differential gears to spin, no energy is wasted braking an airborne wheel; simply declutching it sends all torque to the tractive wheel. 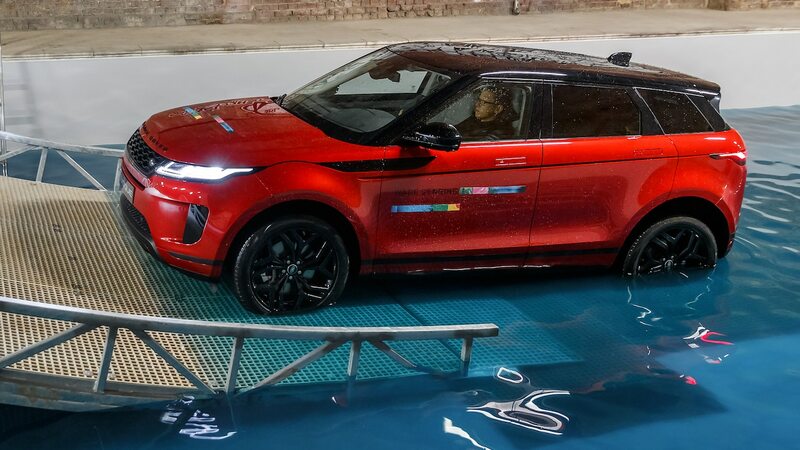 And the 13-percent stiffer body elicited barely a creak during these twist-inducing maneuvers. 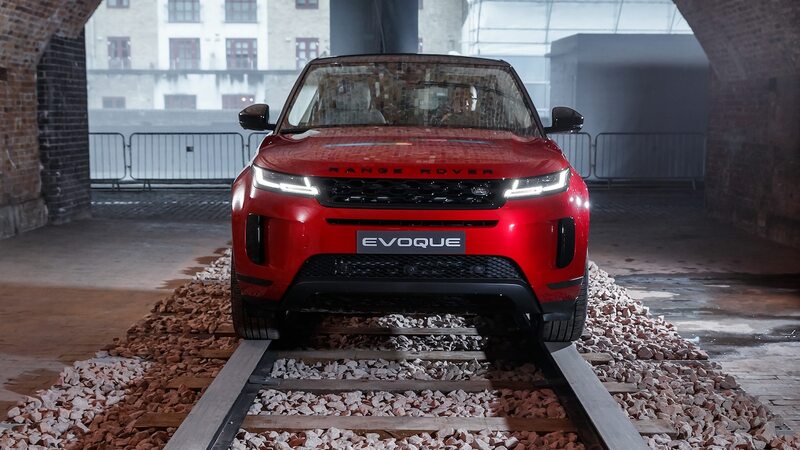 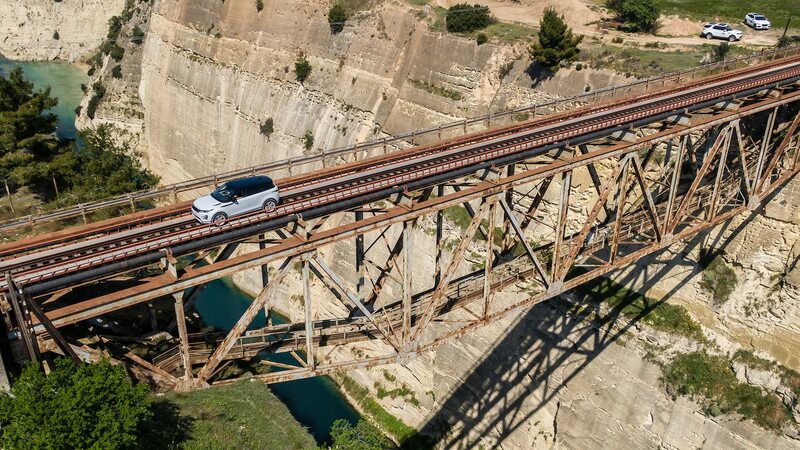 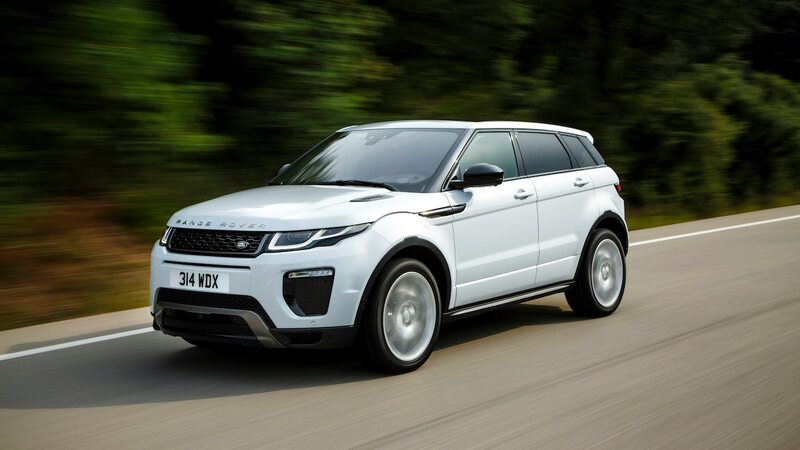 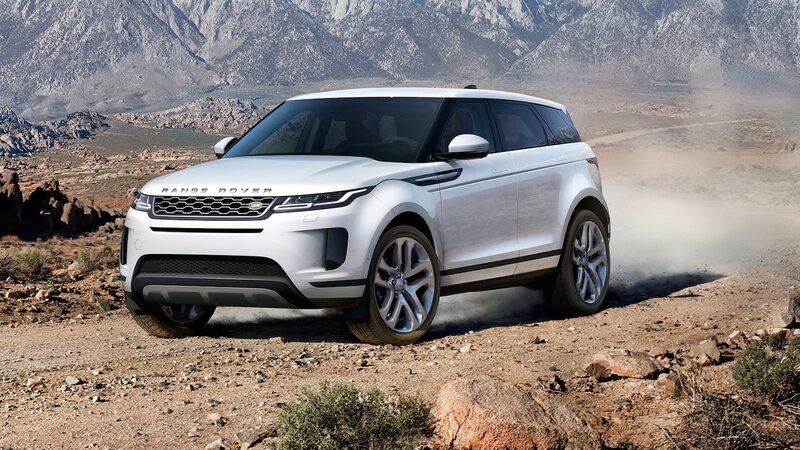 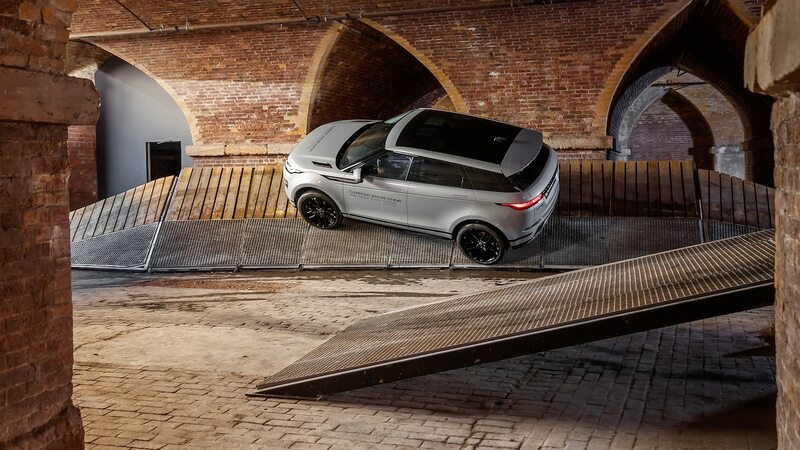 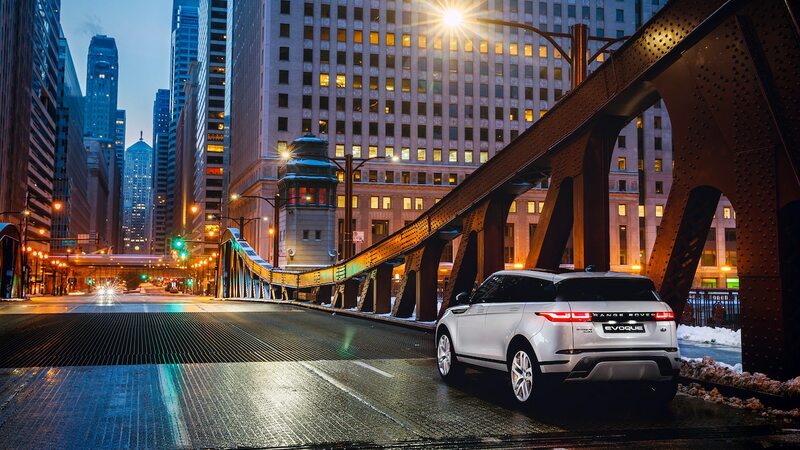 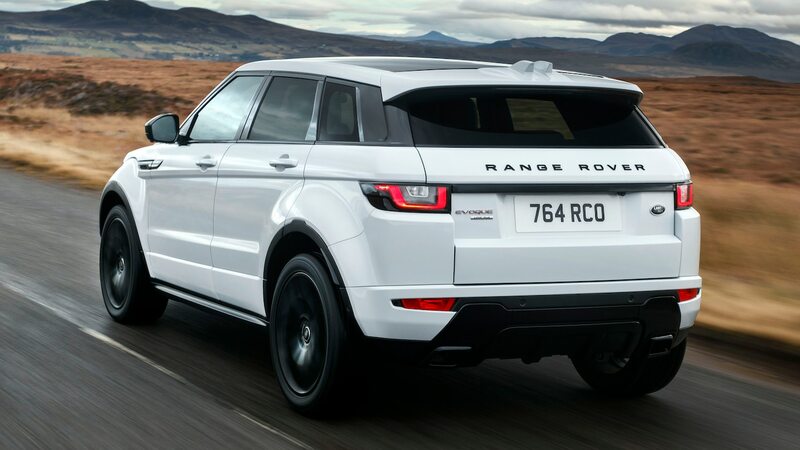 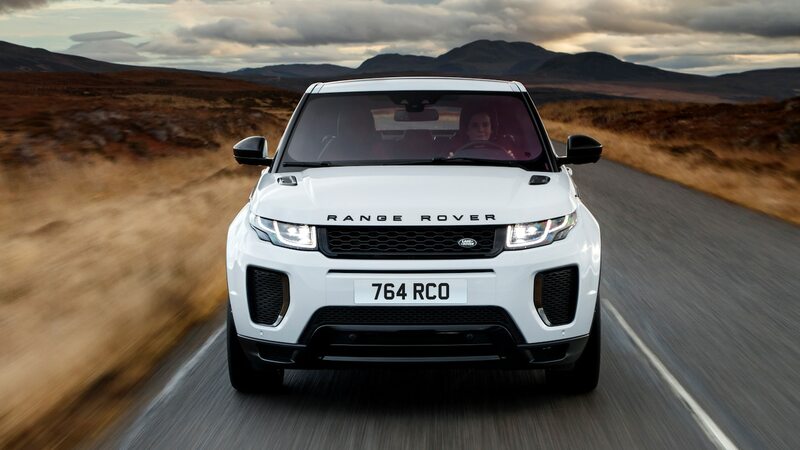 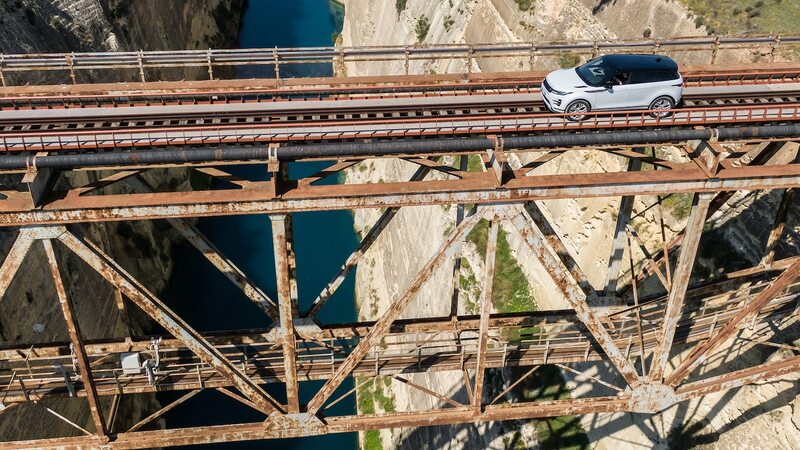 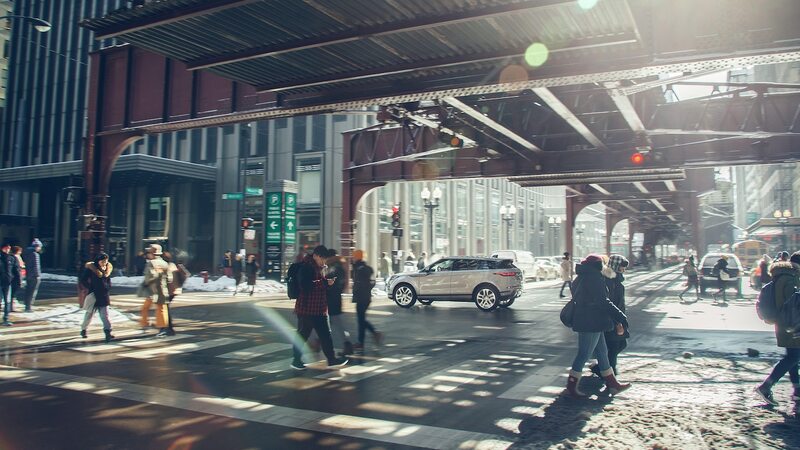 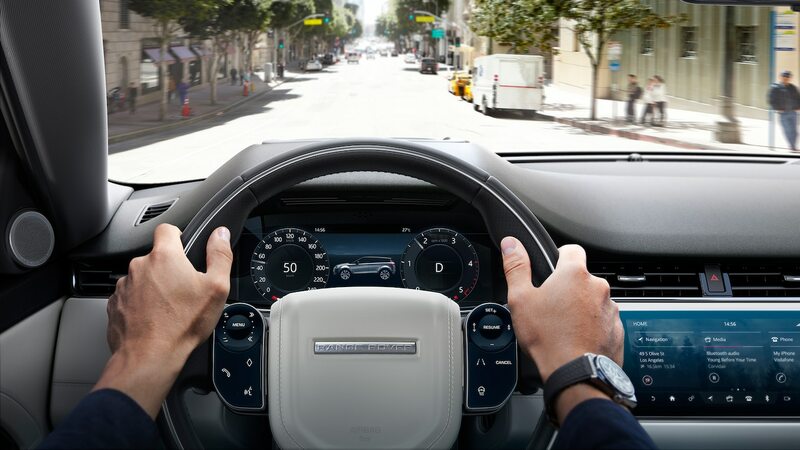 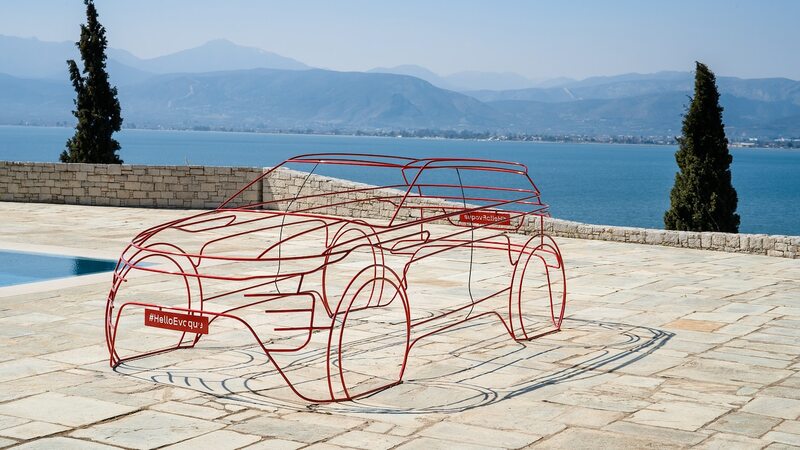 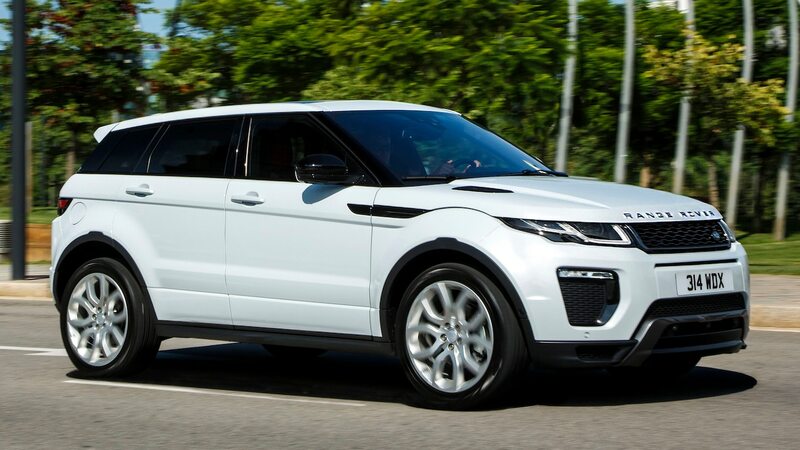 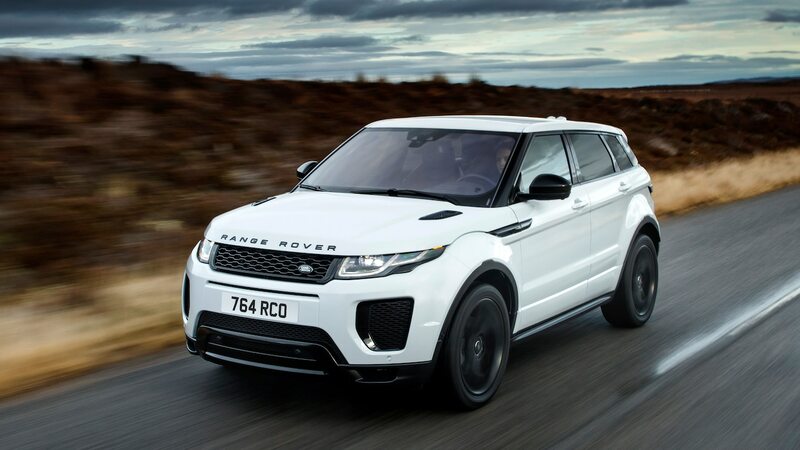 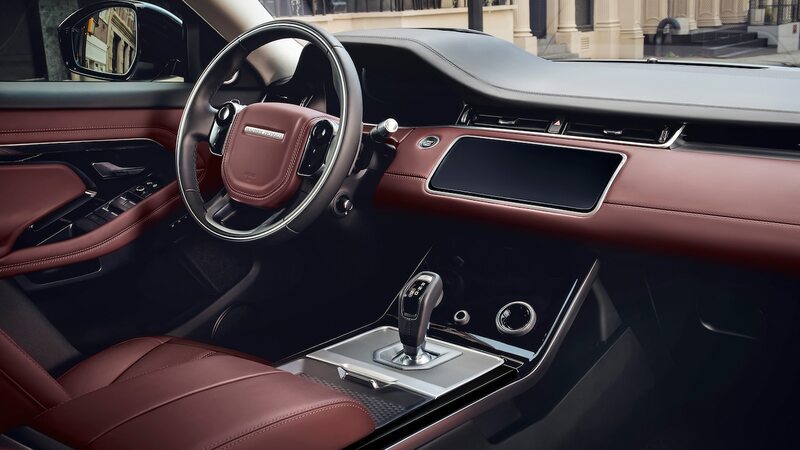 The Evoque remains a compelling choice in terms of design, driving dynamics, and even package efficiency. 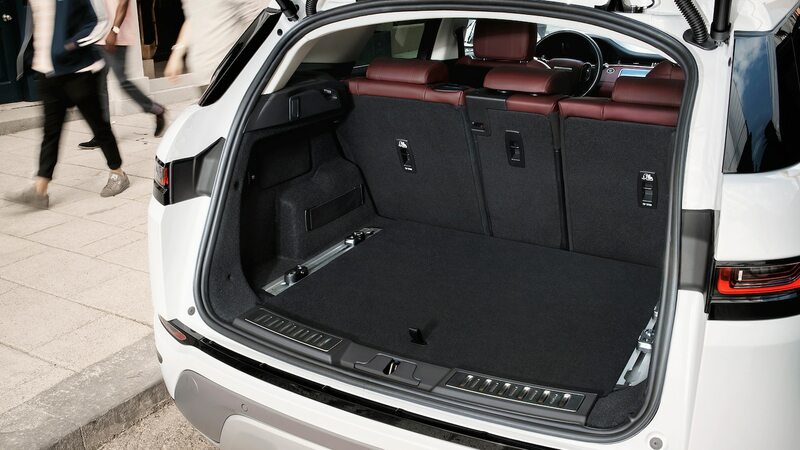 Comparing other fashion-forward compact-luxe utes that overlap the Evoque’s price range, the Alfa Romeo Stelvio is a foot longer while offering less passenger and cargo space; the Mercedes GLC 300 and Porsche Macan are also about a foot longer while ceding about 2 cubes of rear luggage space to the Evoque. 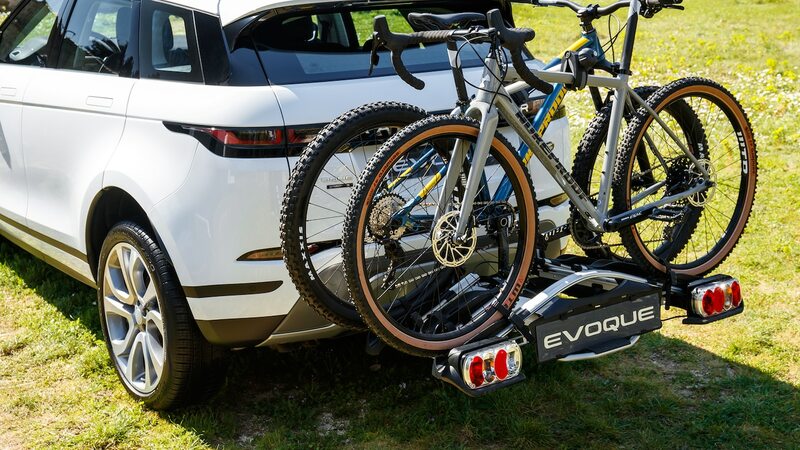 Of course, the Evoque’s E-Pace cousin from Jaguar delivers a bit more passenger and cargo space in the same basic footprint and at a price that starts out $4,050 USD less with similar powertrains. 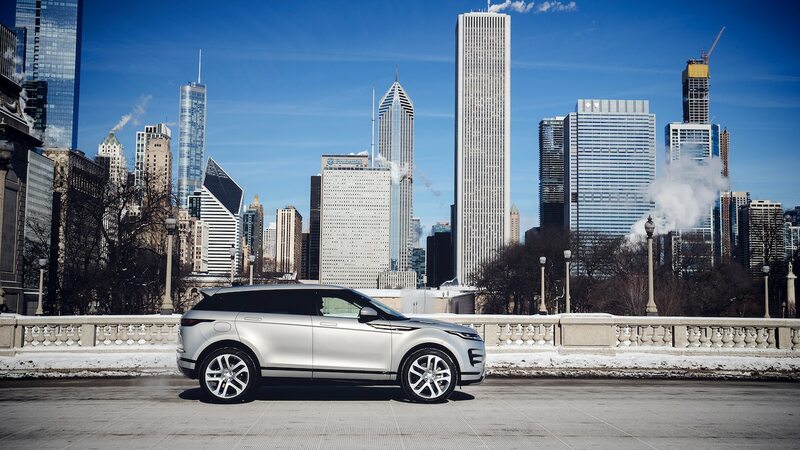 But let’s be honest—it’s just not as pretty.